Christmas and Santa Claus Prints for sale. 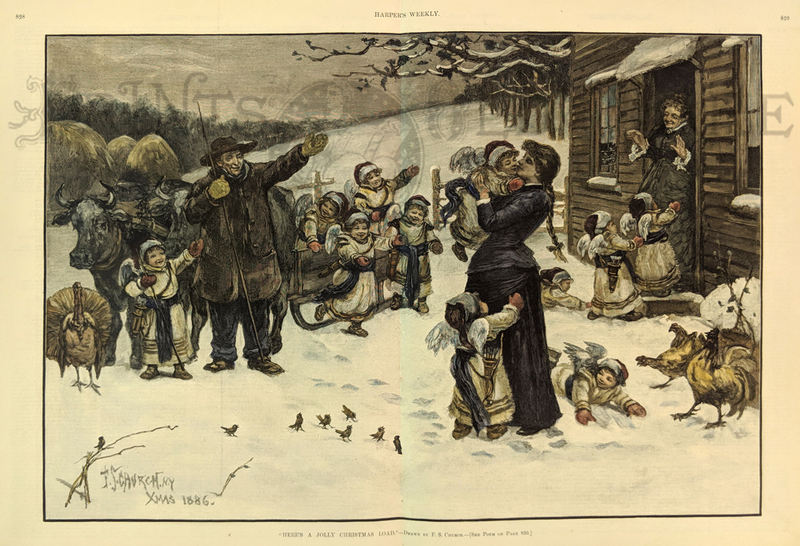 1885 Hand colored wood engraving titled, "Christmas Decorations By Jack Frost." Featured in Frank Leslie's Illustrated Newspaper. 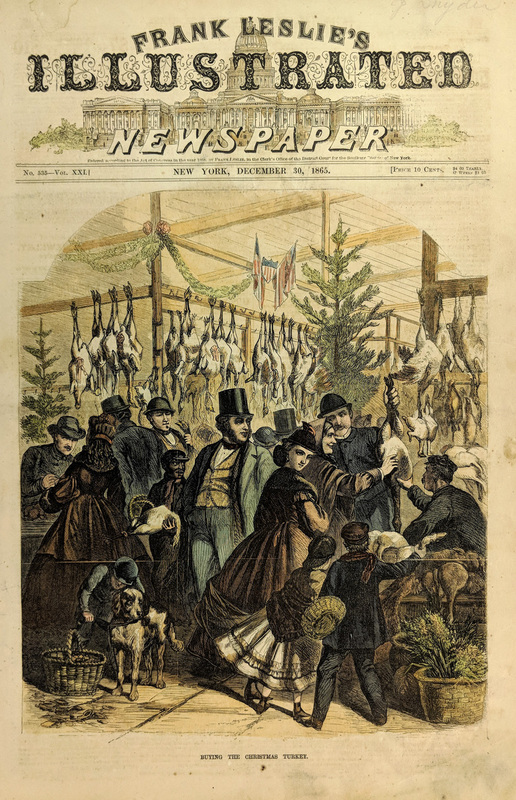 1865 Shopping for Christmas Dinner. 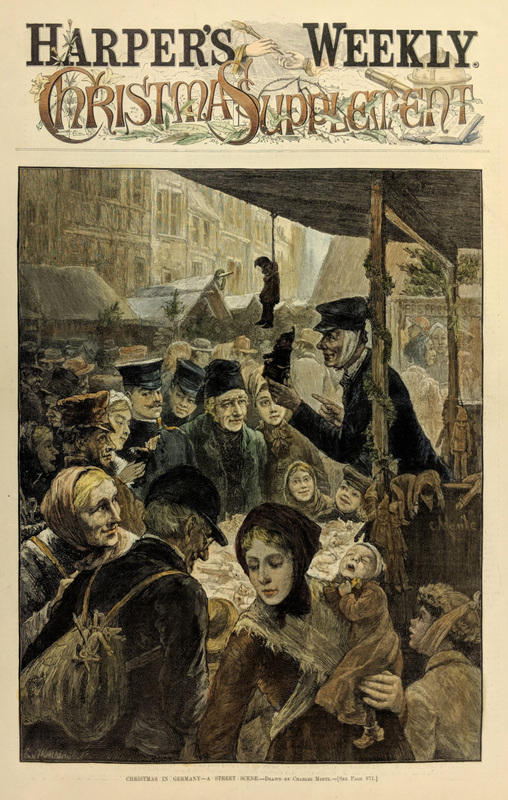 Hand colored woodcut engraving from Frank Leslie's Illustrated Newspaper, titled "Buying the Christmas Turkey." Shows a crowd of holiday shoppers inspecting birds in an open air market. 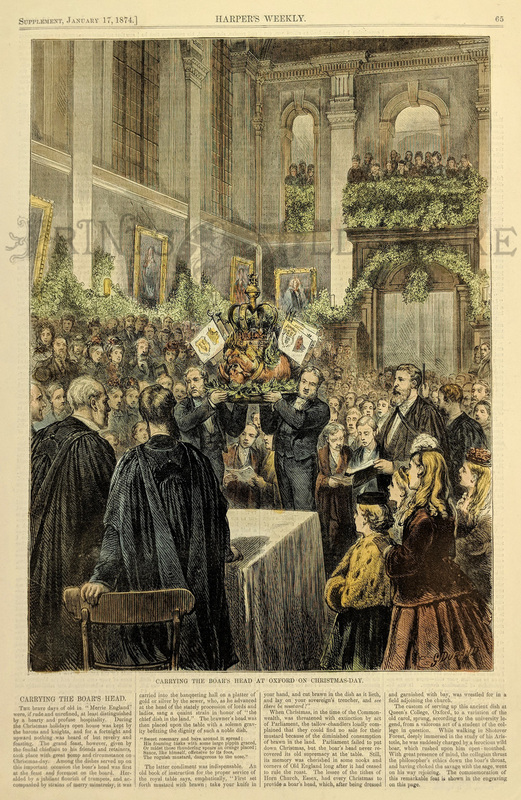 1885 Christmas Scene in Germany. 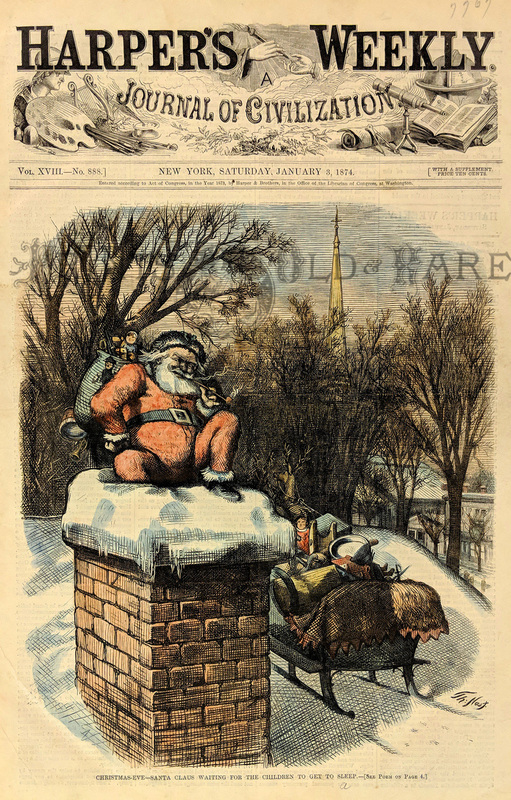 Hand colored, engraved scene from the Christmas Supplement to Harper's Weekly. Title is "Christmas in Germany: A Street Scene." Shows people crowding around a vendor who is selling small wooden dolls. 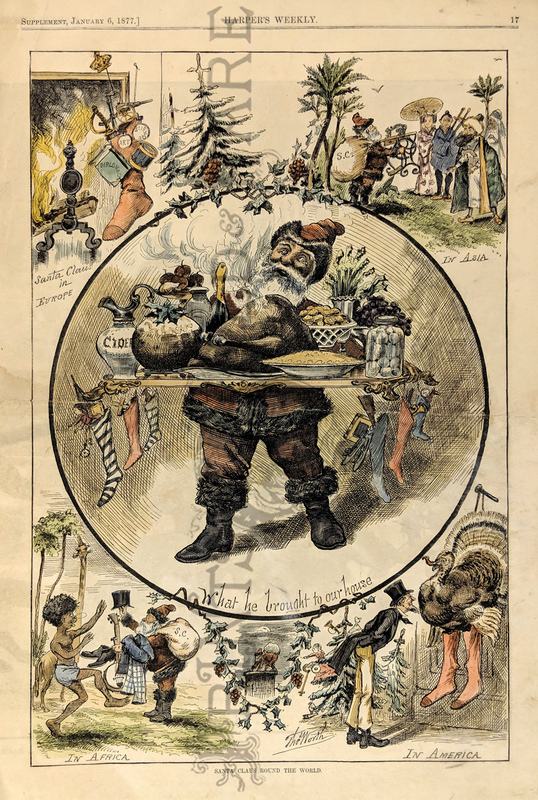 VERY RARE, Old Christmas Santa by Thomas Nast. 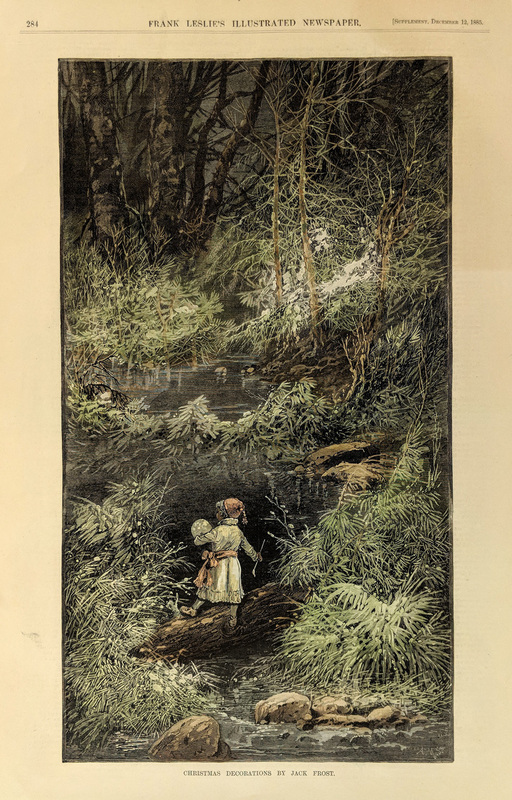 This beautifully hand colored, rare engraved scene was drawn by Thomas Nast and published in the Jan. 4, 1873 issue of Harper's Weekly. 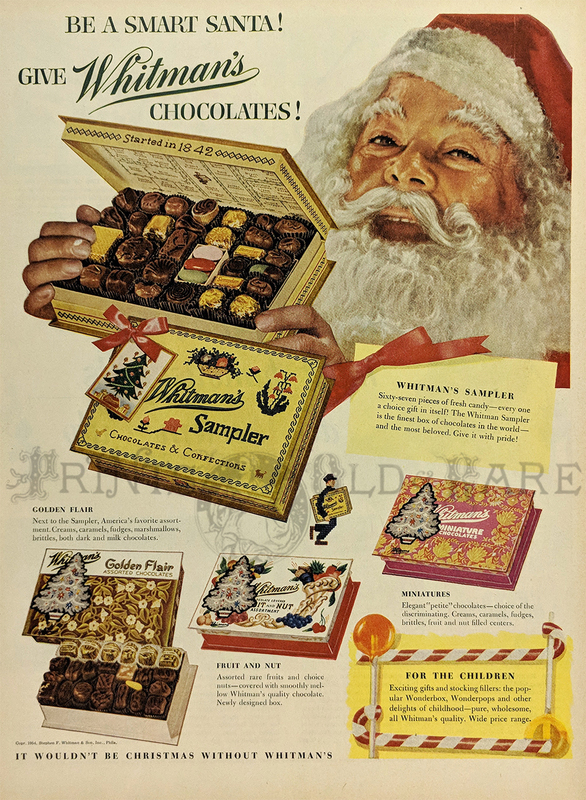 Nast was the originator of our modern concept of Santa Claus, and this is a fine example of his work. 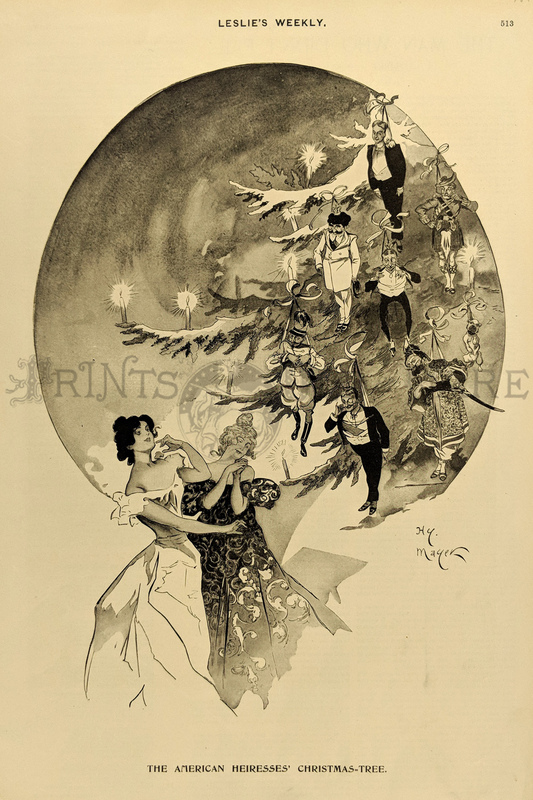 The scene is titled "The Same Old Christmas All Over Again." 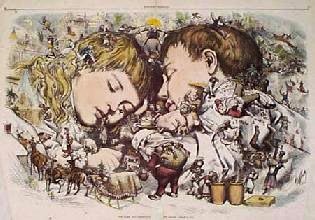 It features two young children asleep in their beds, with fanciful images of toys and storybook characters around them. 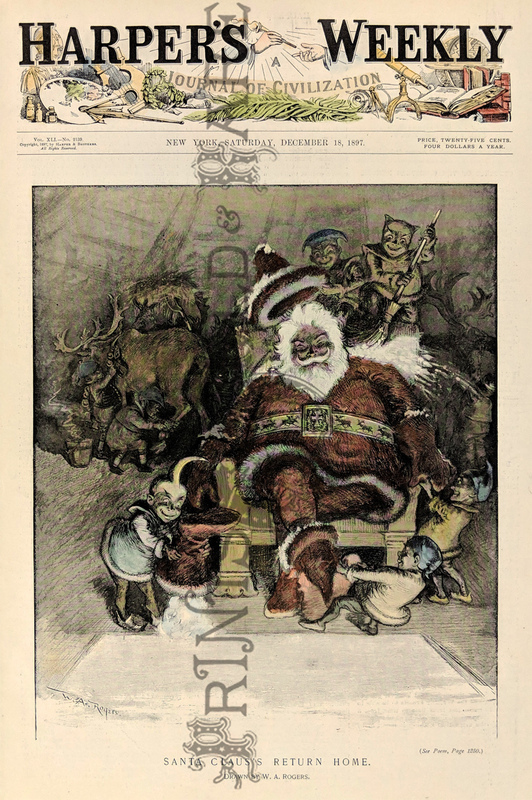 Santa Claus is in the front of the scene, bowing towards the children. 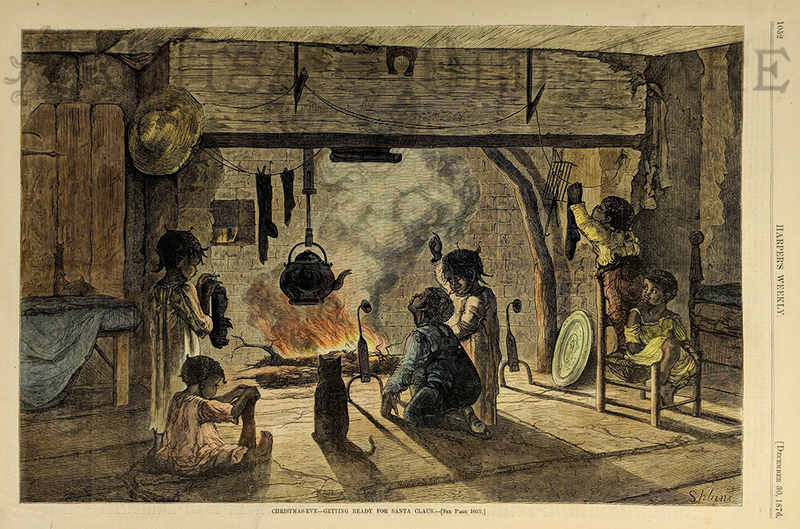 Several repairs have been made to this print, by a restoration professional. The margins in the bottom left and right corners have been extended, where part of the paper was cut off, but the image is not affected. In the bottom center of the sheet, a one-inch piece has been replaced and a small part of the title is missing in that spot. Overall condition is really quite good, though, and this print would look fantastic in a frame!! 1900 hand colored half-tone showing sailors in a raging storm. 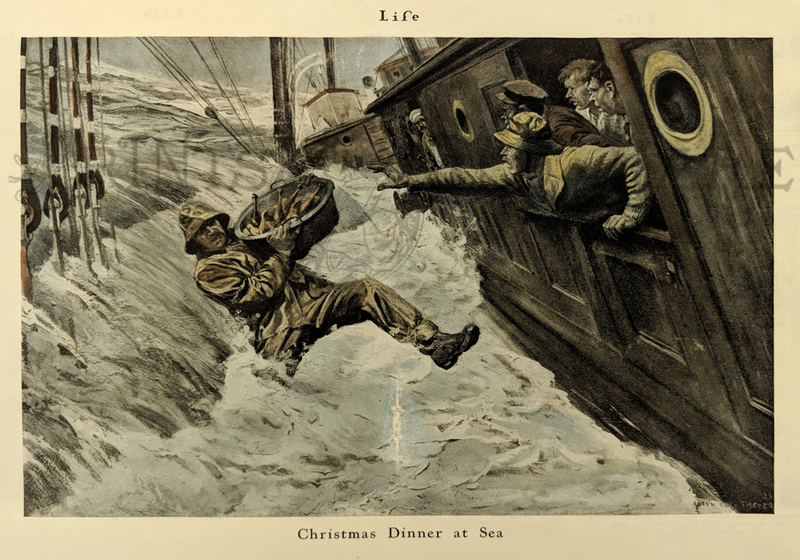 Caption reads Christmas Dinner at Sea. 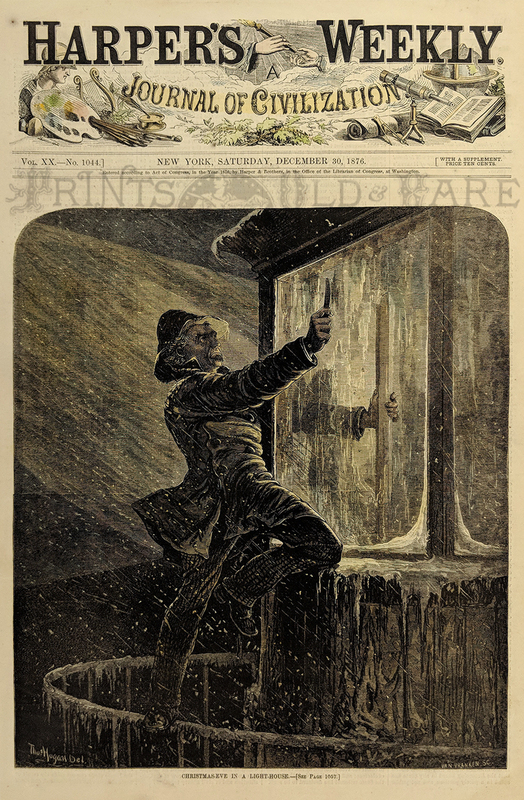 Harper's Weekly cover from December 16, 1882. 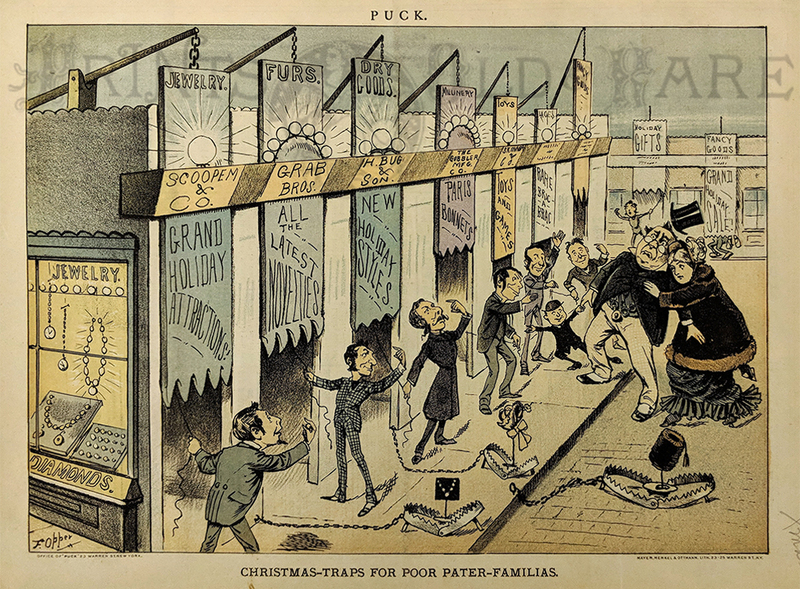 Hand colored engraving showing a store front being decorated for Christmas with customers looking on. Picture titled "Getting Ready for Christmas." Drawn by W.L. Sheppard. 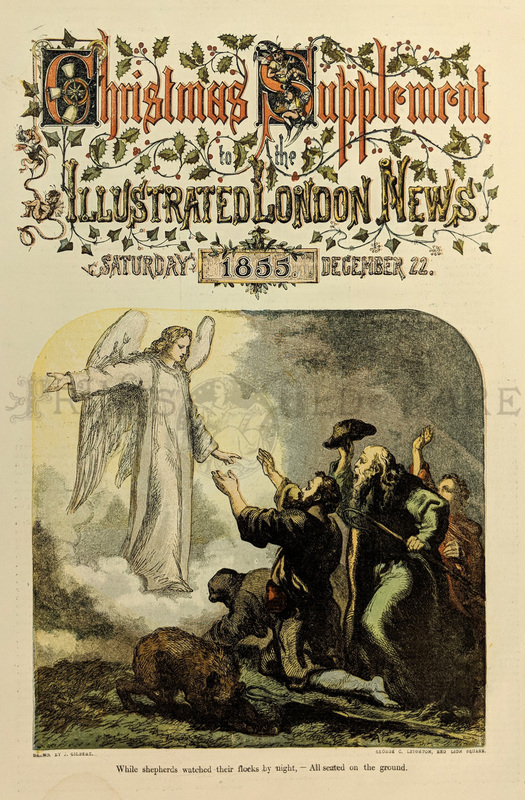 The Illustrated London News dated December 21, 1867. 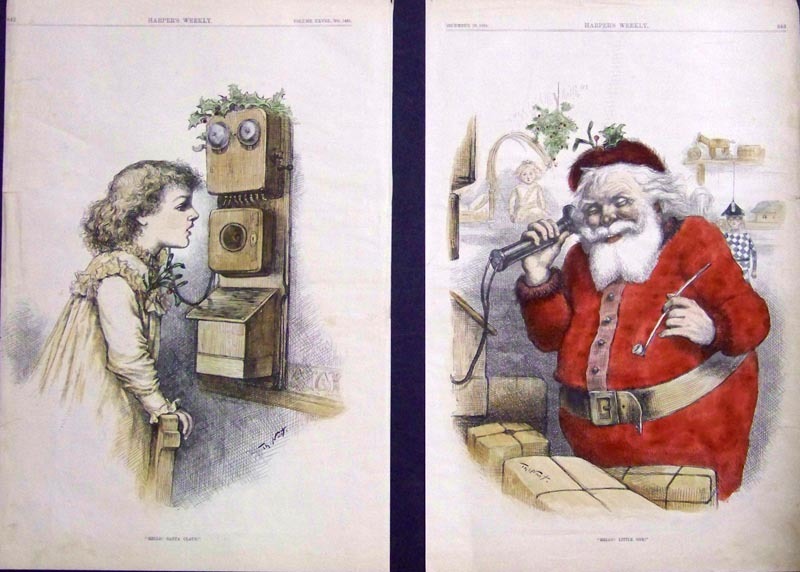 Two hand colored engravings titled "Christmas Time - First and Second Floors". 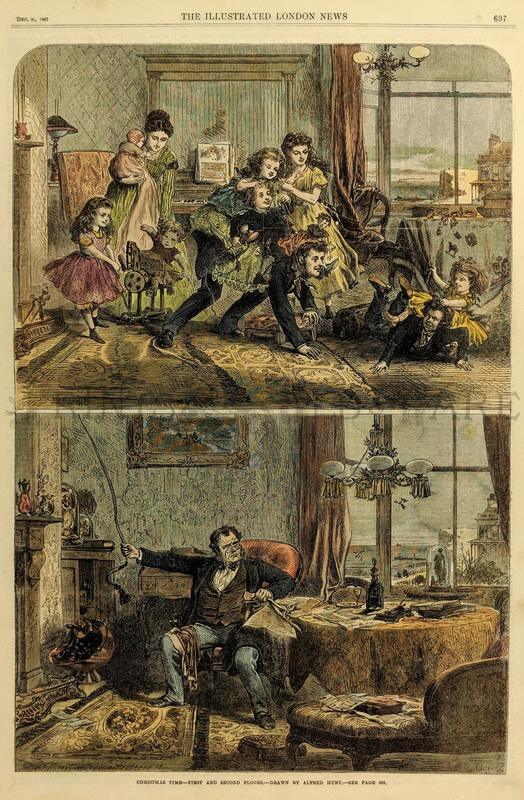 The top picture shows a family playing together enjoying the Christmas fun. The lower picture is a lonely man disturbed by the noise upstairs. Drawn by Alfred Hunt. 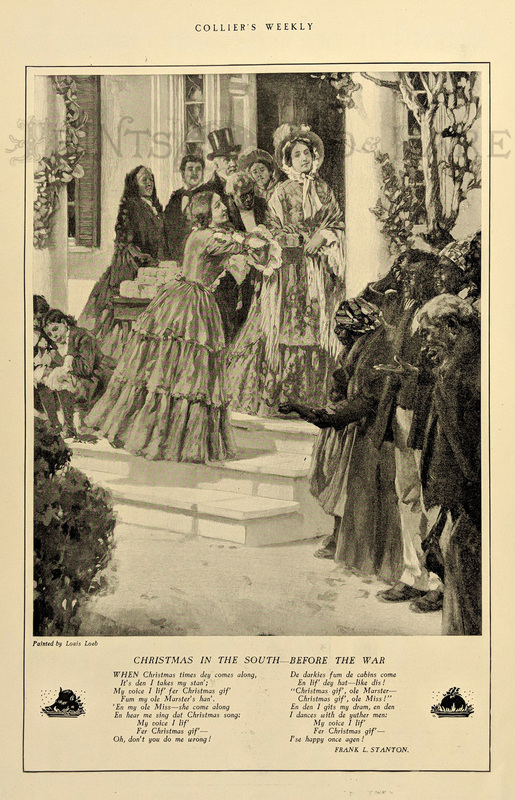 Harper's Weekly Supplement dated December 2, 1882. Picture captioned, "Making Home For Christmas. 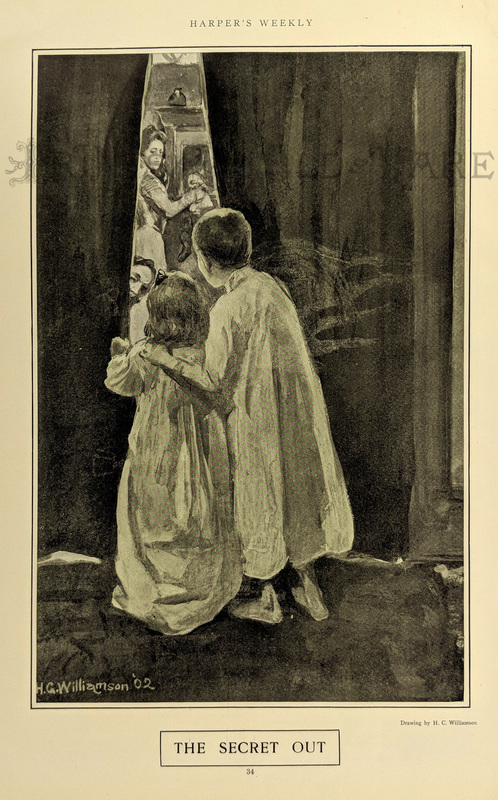 From Harper's Christmas, 1882." 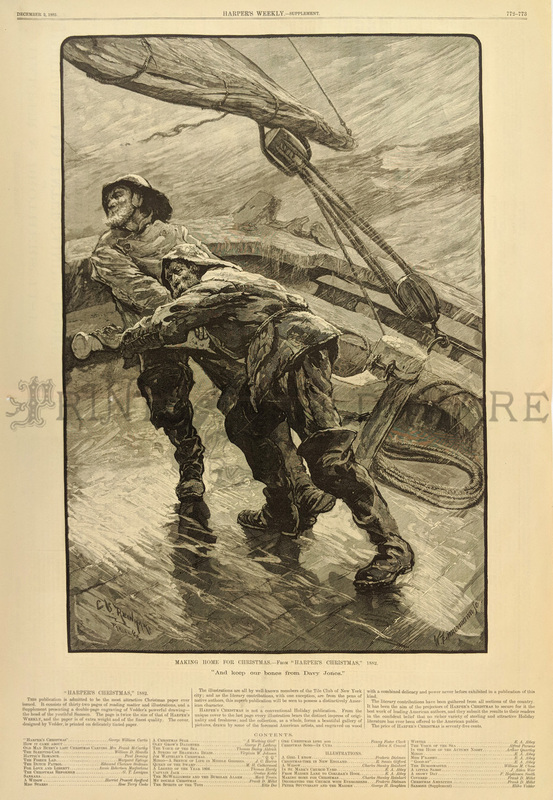 Picture shows two sailor's caught in a storm trying to make it through to get home in time for Christmas. 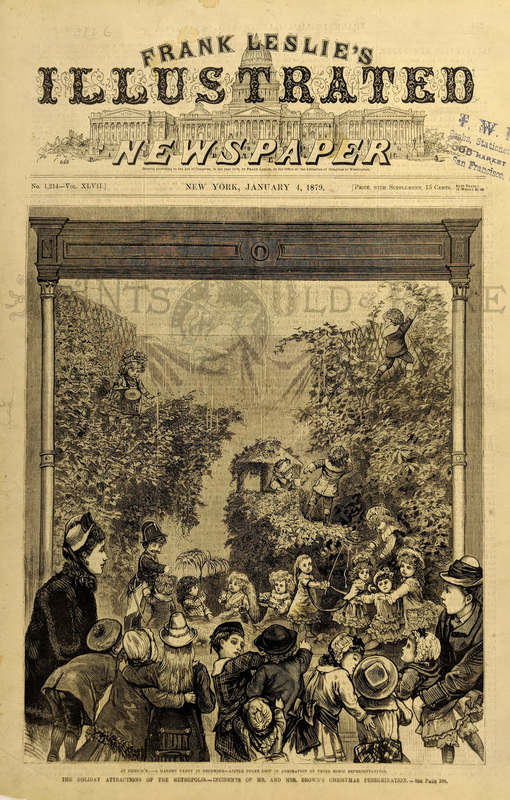 : Frank Leslie's Illustrated Newspaper dated January 13, 1877. 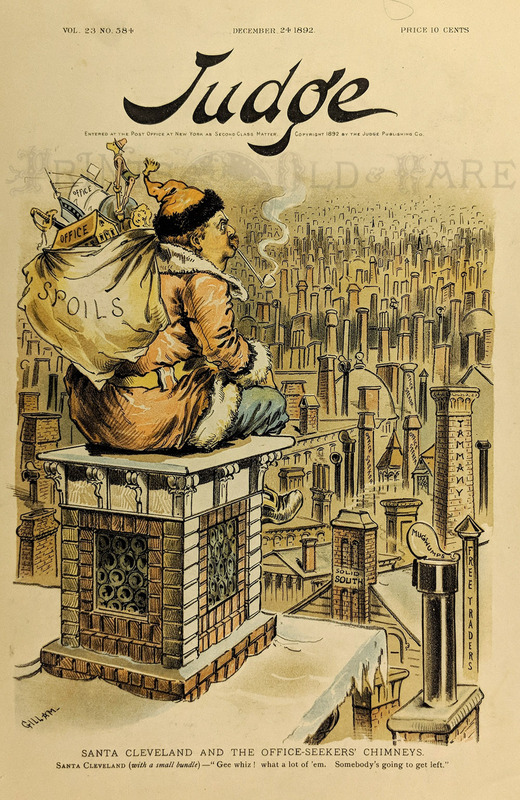 Hand colored engraving titled, "New York City, - The Centennial Holiday Festivities - A Christmas Package Party." Christmas Flirtation. 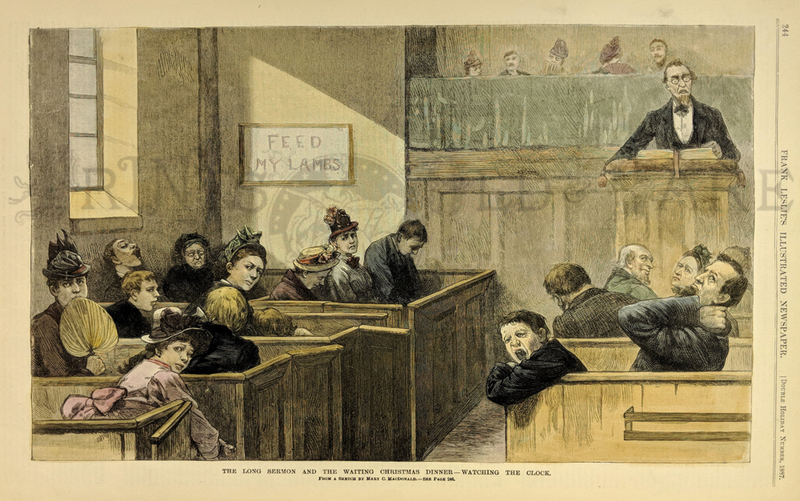 1882 Hand colored Harper's Weekly by Thomas Nast. 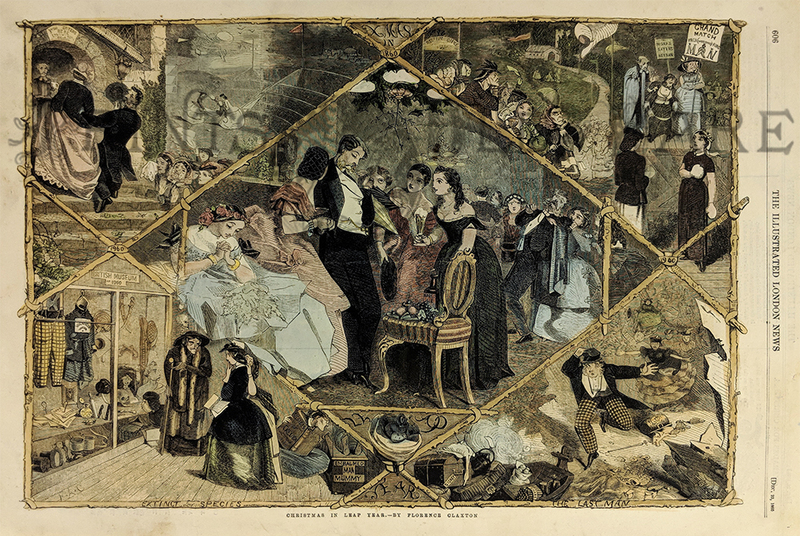 Double page spread from the December 30, 1865 issue of Harper's Weekly. 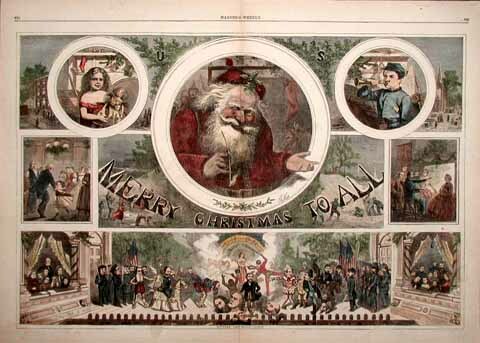 Thomas Nast wishing a "Merry Christmas to All". Large center picture of Santa Claus. Two small round pictures on top show a little girl and boy with their Christmas gifts. Two pictures in center on left and right side show family celebrations. Long picture across the bottom shows Grant, with the heads of his opponents, surrounded by the soldiers and politians that supported him during the Civil War. Picture captioned, Ulysses the Giant Killer. 16x22 in. 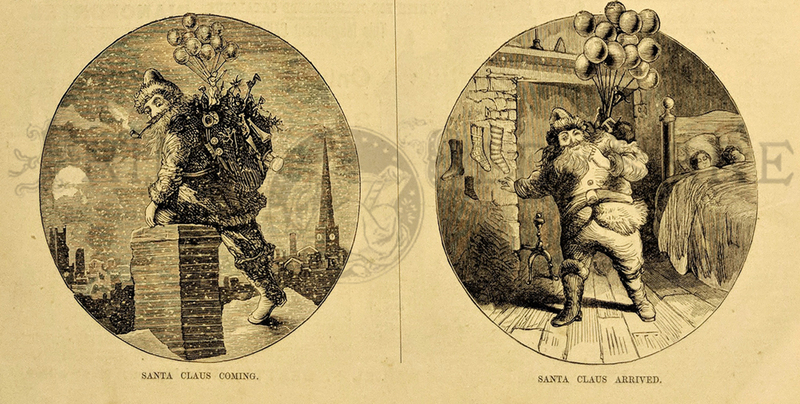 1889 Santa Claus / Father Time / New Year done by Lagarde. 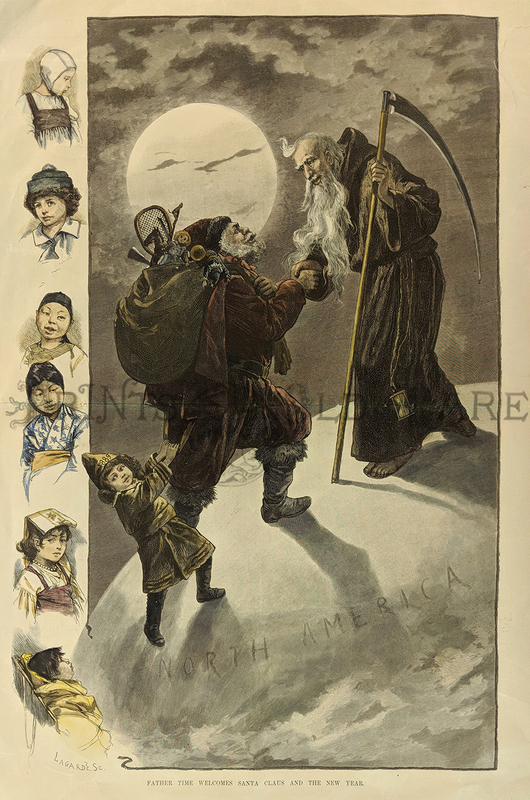 Shows Santa and Father Time shaking hands over North America with little "New Year" tugging at Santa. Full moon in backround. Side panel shows 6 different nationalities of children. Excellent condition. C.1880 Picture of Santa Claus. 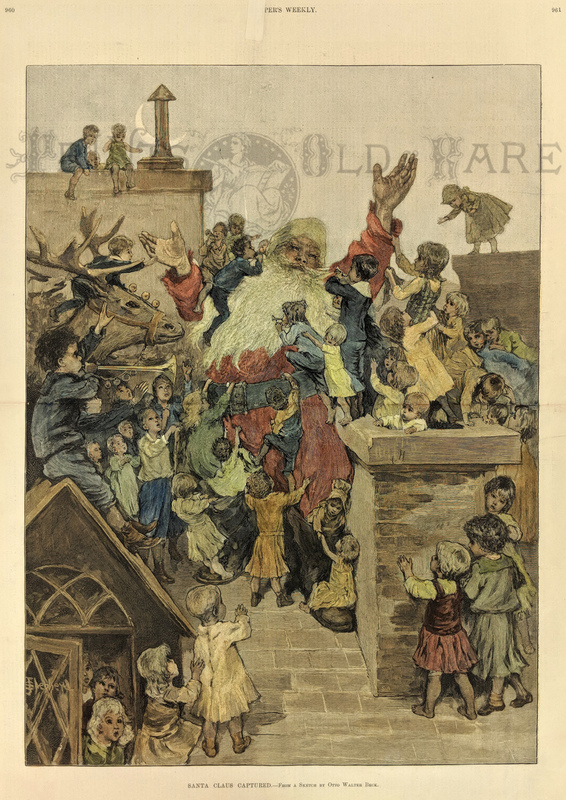 Elegant hand colored wood engraving titled, "Santa Claus Coming and Santa Claus Arrived," from Gleason 's New Pictorial. Shows scenes of Santa Claus arriving and departing via the chimney. 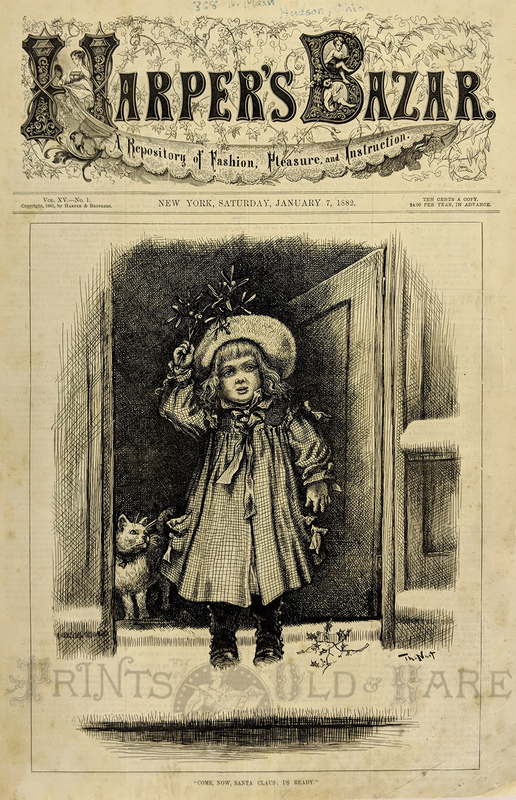 1902 Image of a little girl adoring her doll on Christmas morning. 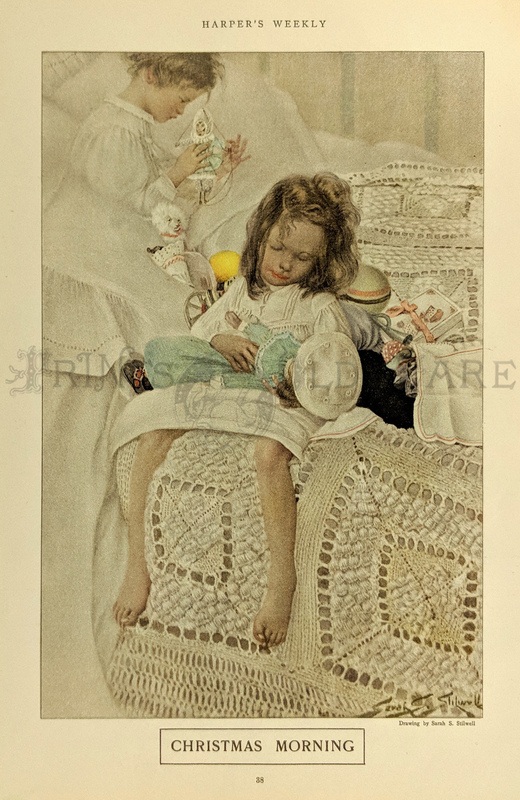 Elegant hand colored engraved image titled, "Christmas Morning, " drawn by Sarah Stilwell from Harper's Weekly. Shows scene of a little girl adoring her doll on Christmas morning. 1902 Picture of a man traveling through the snow during Christmas. 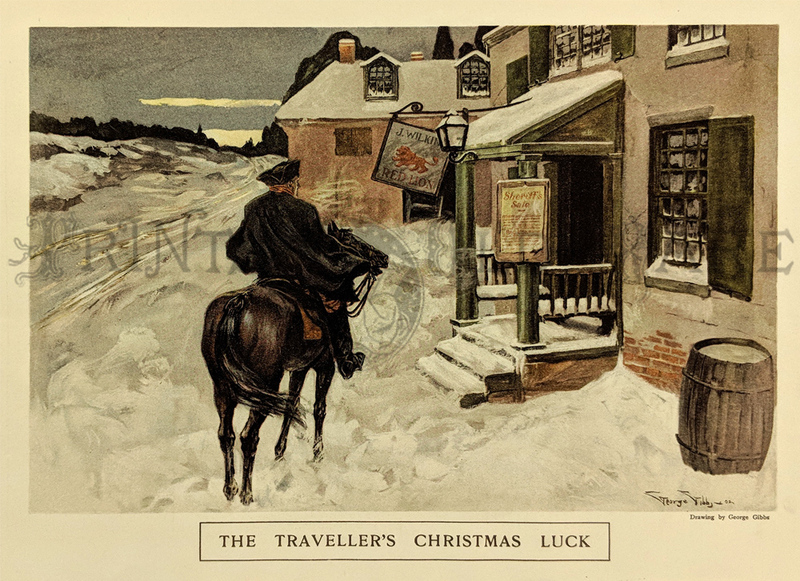 Gorgeous hand colored engraved image titled, "The Traveller's Christmas Luck," drawn by George Gibbs from Harper's Weekly. 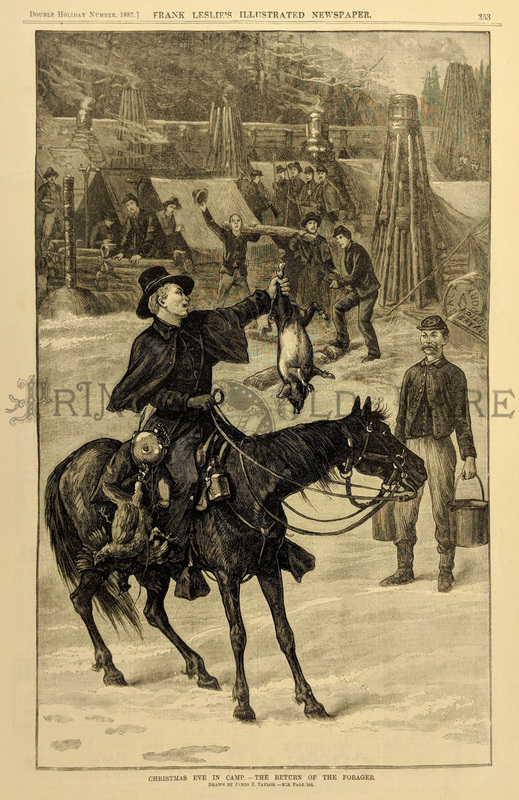 Shows a man traveling by horse through the snow during Christmas. 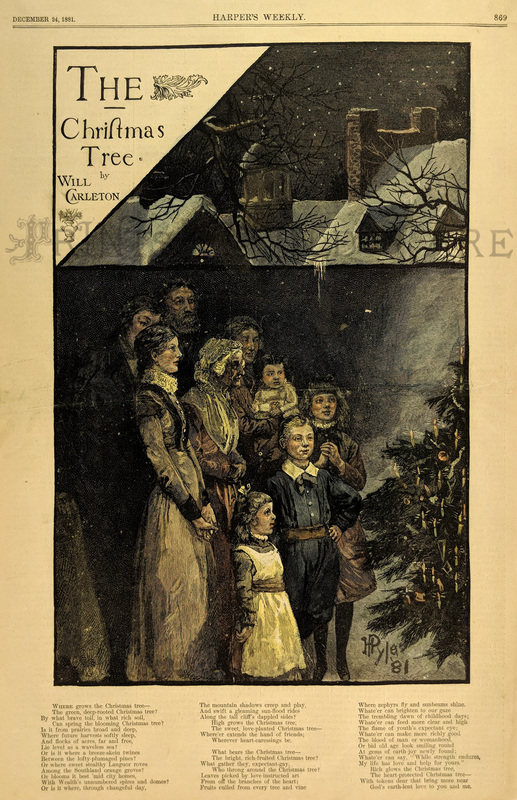 1881 The Christmas Tree by Will Carleton. 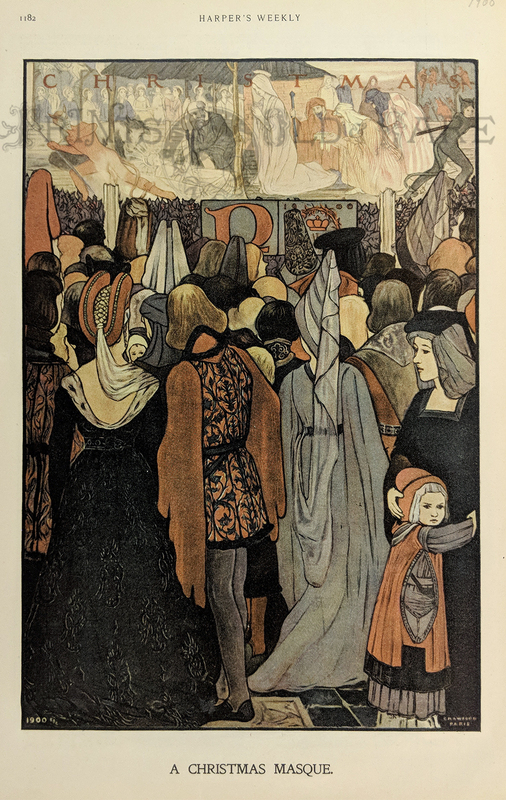 Poem and hand colored wood engraving by Howard Pyle, published in Harper's Weekly. Poem shares the fondness of a Christmas tree and picture depicts a large family admiring theirs and picture above reveals the snow-laced rooftops and the beautiful starry sky. 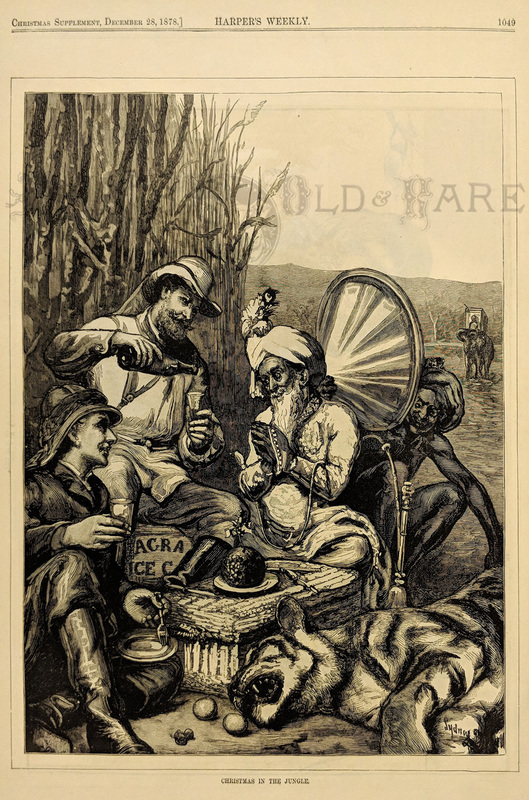 1855 Bringing In The Boar's Head --- By J. Gilbert. 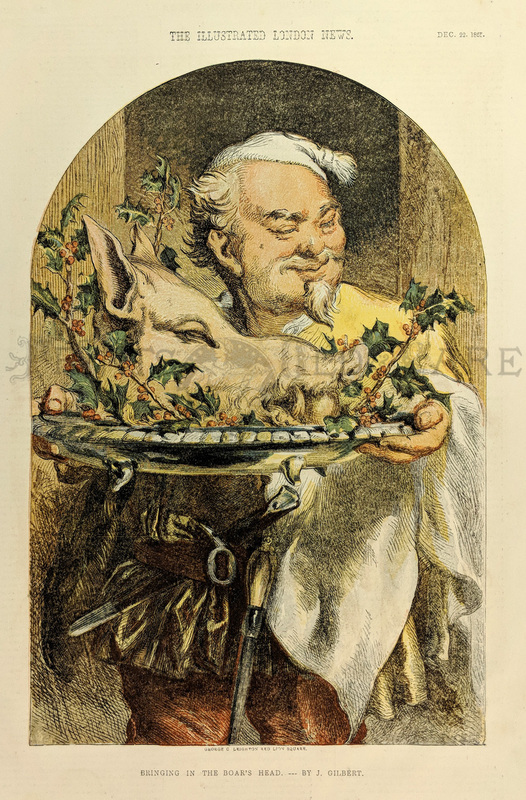 Colorful lithograph by George C. Leighton, Red Lion Square which depicts a happy man holding a platter with a boar's head and holly on it. 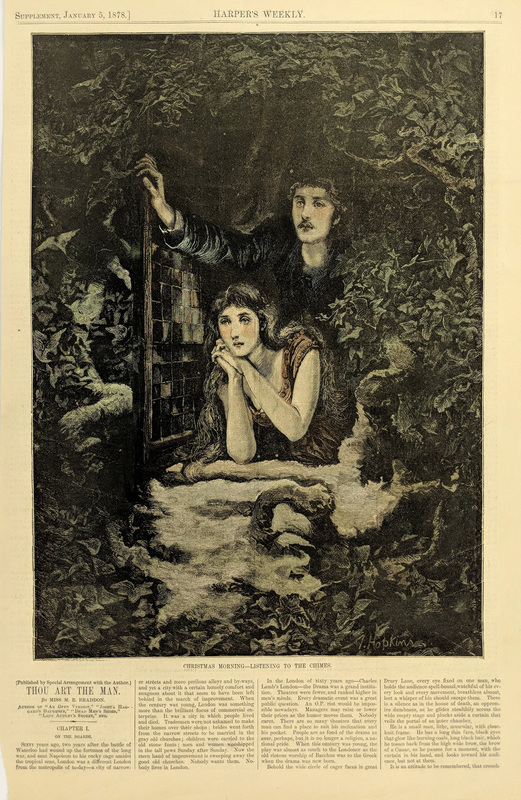 Published in The Illustrated London News. 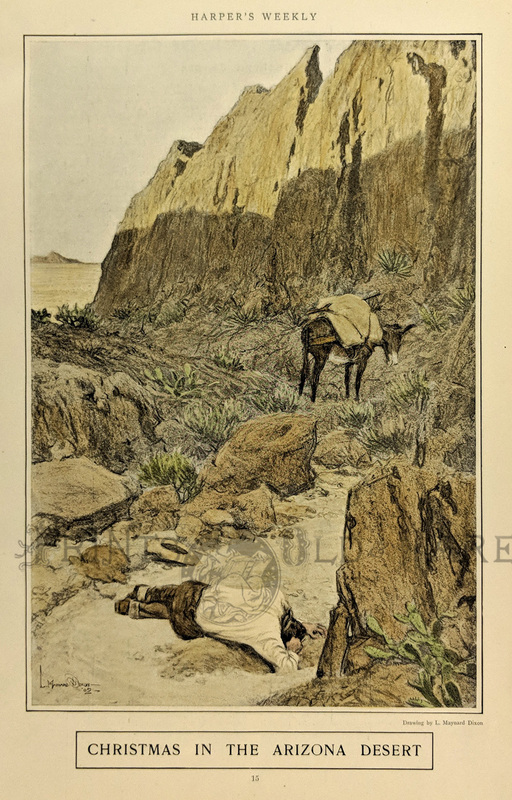 1855 "While Shephard's Watched their Flocks By Night, - All Seated on the Ground." 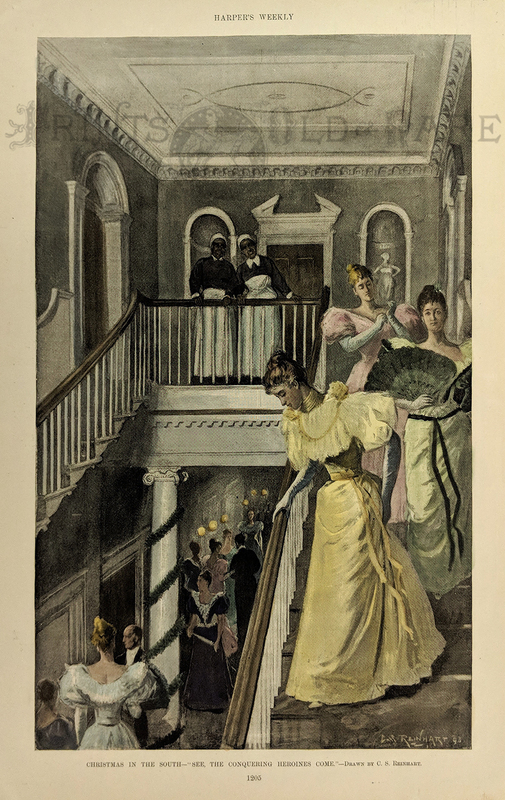 Beautifully illustrated lithograph by George C. Leighton, Red Lion Square which depicts an angel appearing before a group of men who are in awe of her splendor. 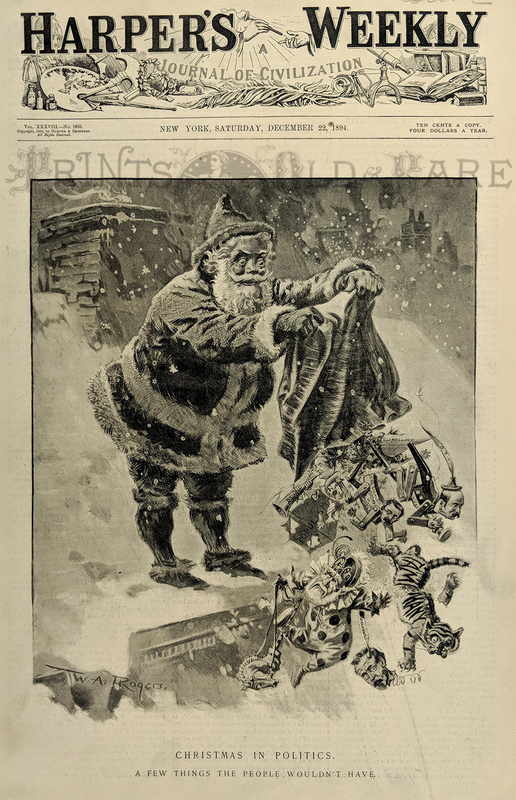 Drawn By J. Gilbert and published in the Christmas Supplement to the Illustrated London News. 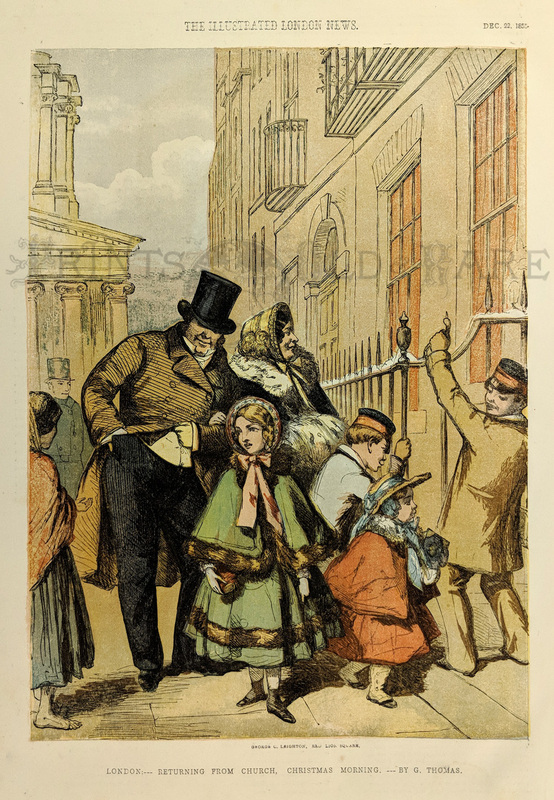 1855 London: --- Returning From Church, Christmas Morning. --- By G. Thomas. Colorful lithograph by George C. Leighton, Red Lion Square which depicts a happy family returning from church on Christmas morning. 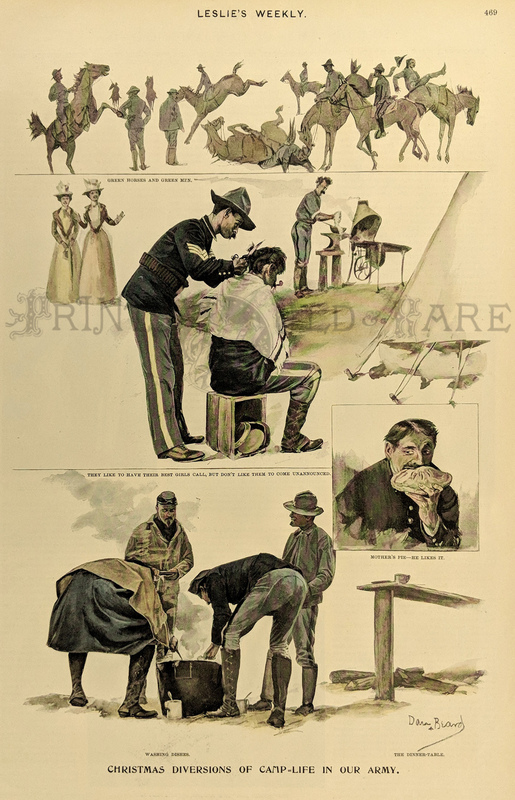 Published in The Illustrated London News. 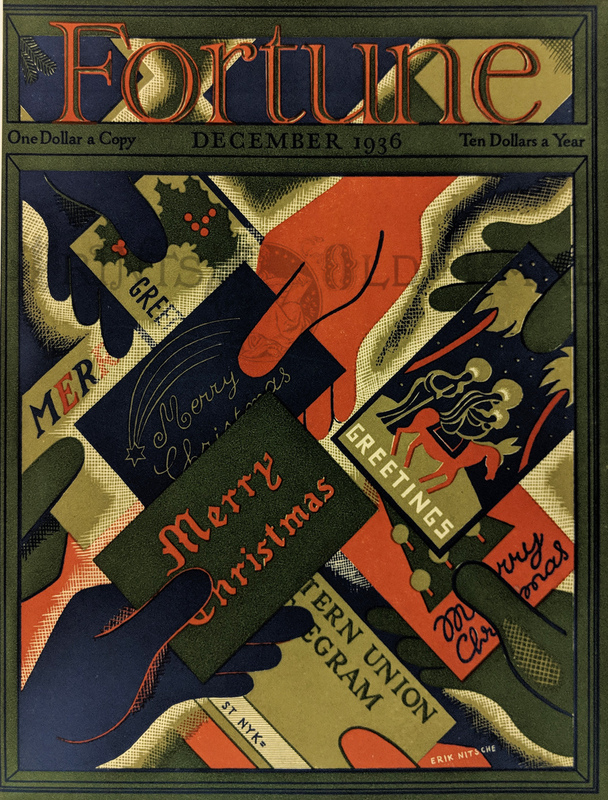 1936 Colorful front page of Fortune magazine from December, 1936 showing red and blue gloved hands holding Christmas greeting cards. Cover is by the Swiss-born modernist graphic designer Erik Nitsche. Advertisement for Kool Cigarettes is on back of cover. 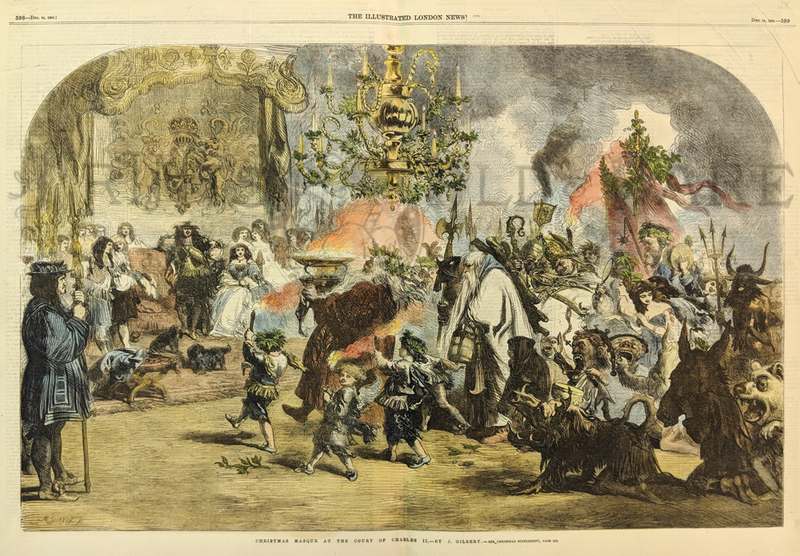 1877 Hand colored wood engraving featured in Harper's Weekly, A Journal of Civilization showing children surrounding their maid encircled by a garland of holly. 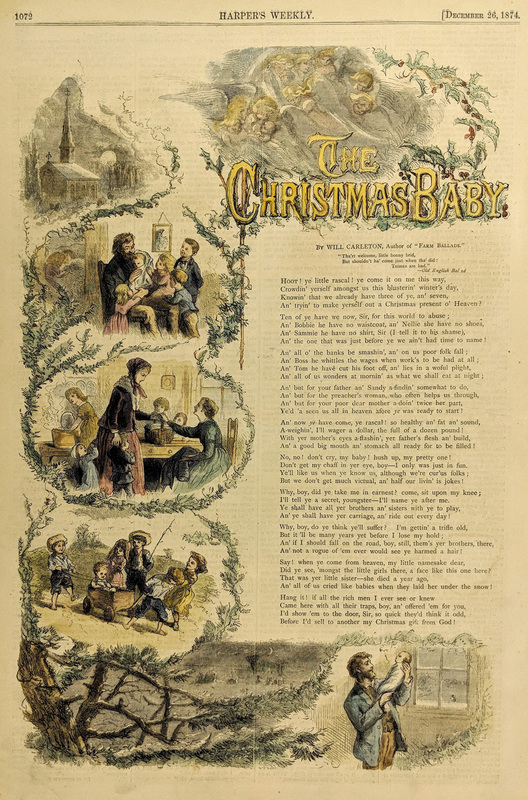 A poem titled, "The Christmas Baby" is presented on bottom right corner. Top border has some staining and writing which can easily be removed. 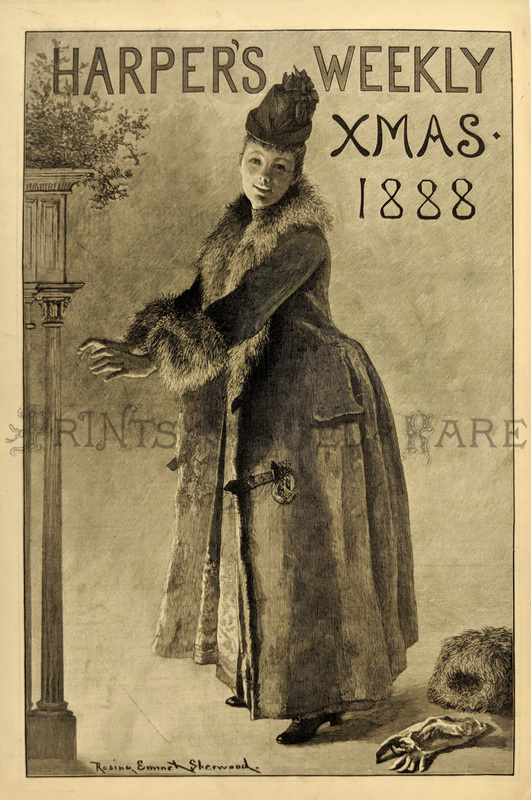 1888 Harper's Weekly Xmas wood engraved cover by artist, Rosina Emmet Sherwood which shows a well-coated woman warming her hands by the fireside. Her gloves and muff rest on the floor next to her feet. 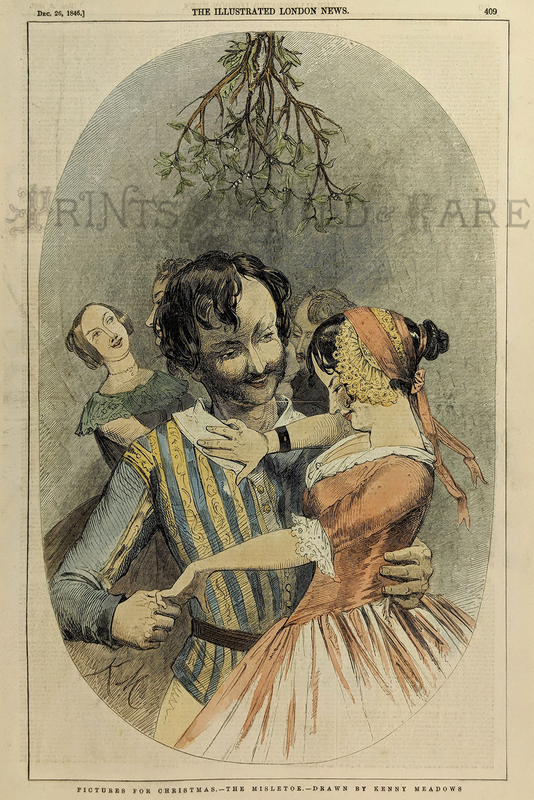 1859 Hand colored wood engraving on a double-page which was featured in The Illustrated London News titled, "Christmas Masque At the Court of Charles II." By J. Gilbert. 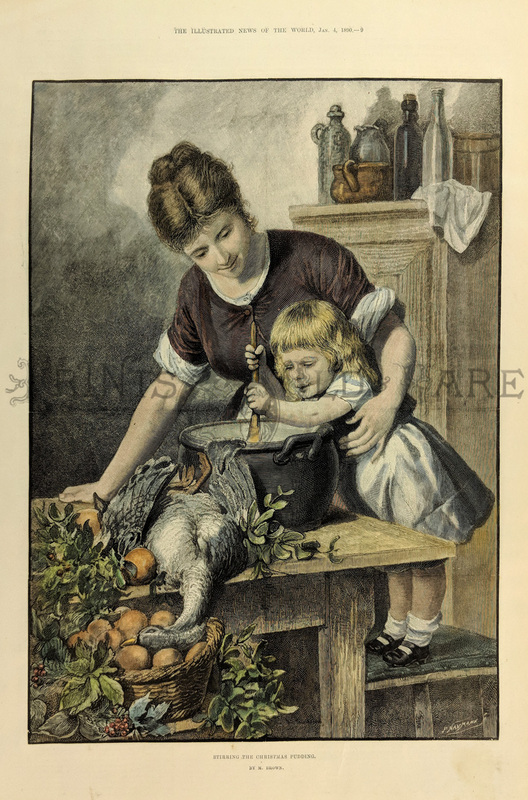 1881 Hand colored wood engraving featured in the German version of Frank Leslie's Illustrated Newspaper. 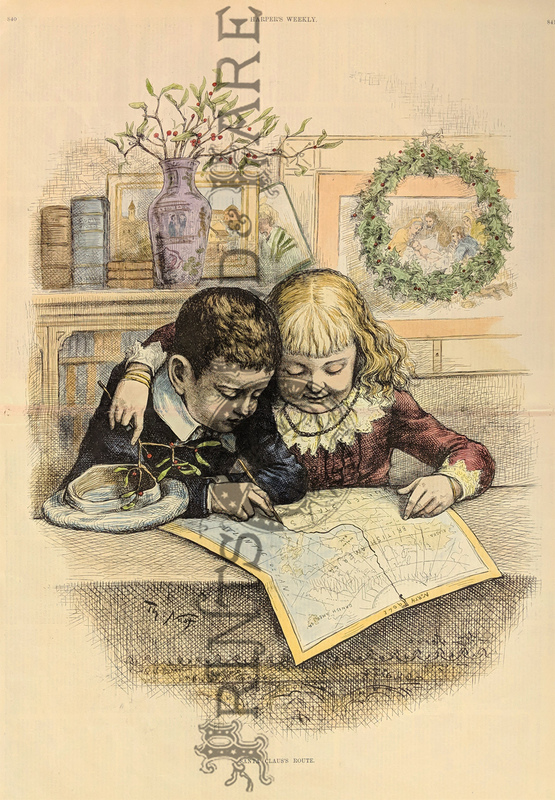 1900 Hand colored lithograph featured in Leslie's Weekly titled, "Fishing for Presents -- An English Christmas Custom." 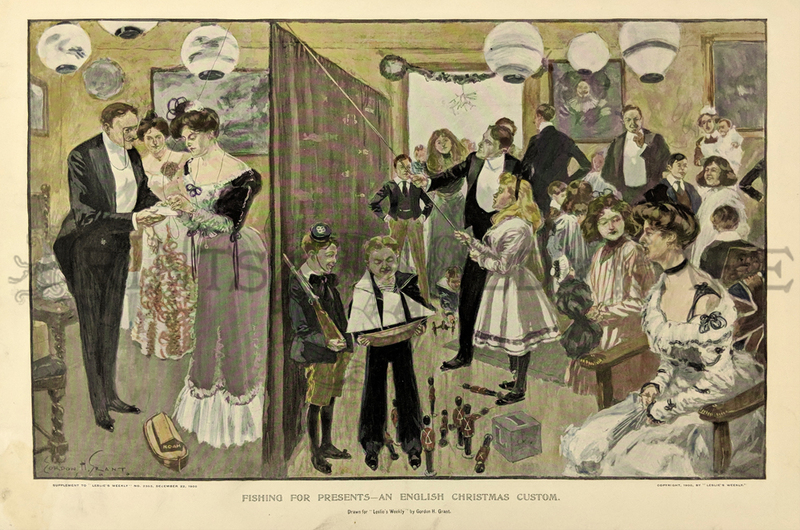 Scene on left shows adults pinning the fishing line on presents and scene on right shows children "fishing" and others checking out their assorted presents. 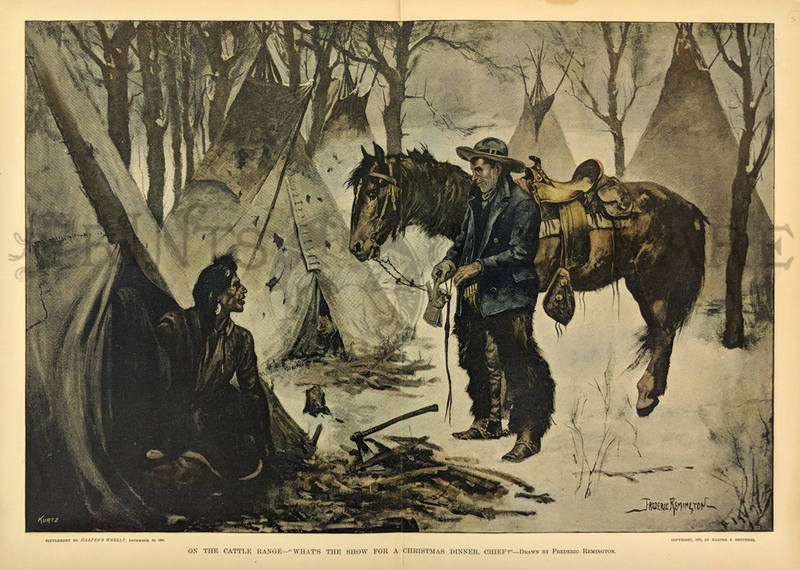 1914 Hand colored lithograph featured in The Graphic Christmas Number titled, "Blindman's Buff." 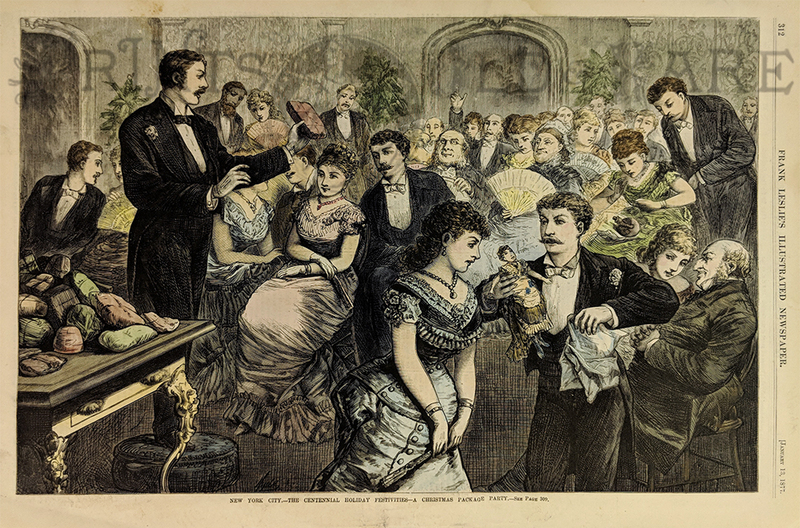 Scene shows a blind-folded gentleman surrounded by elegantly-dressed women and children on a dance floor. 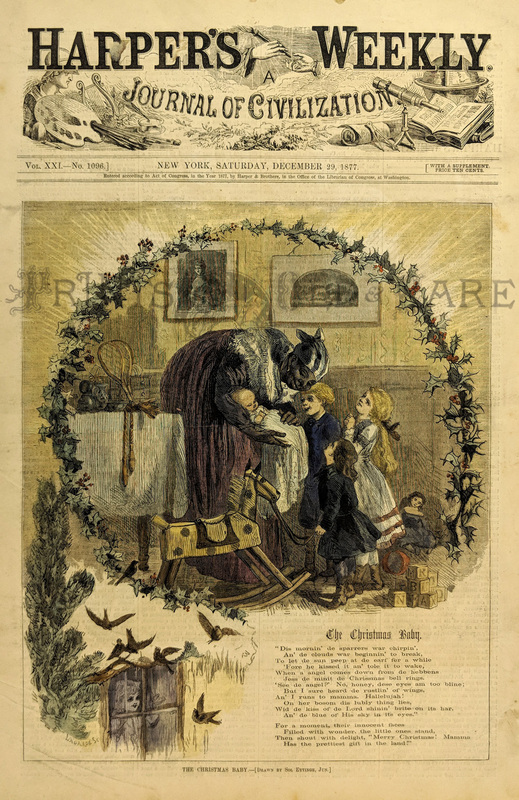 1884 Hand colored wood engraving featured in Frank Leslie's Illustrated Newspaper titled, "Christmas Morning -- Presents for Grandma." 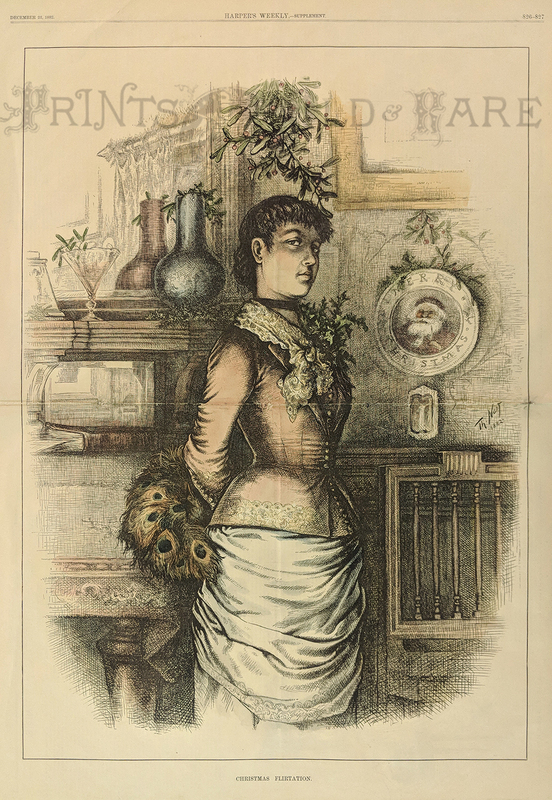 1884 Hand colored wood engraving featured in Harper's Weekly titled, "Under the Mistletoe -- A Test of Courage." Drawn by William T. Smedley. 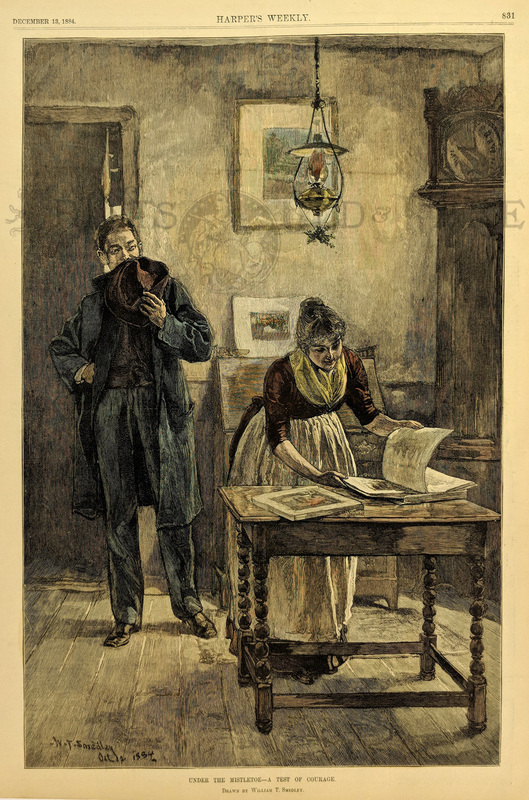 Scene shows a woman looking through a book as she stands under some mistletoe and a gentleman standing behind her as he contemplates sneaking a kiss. 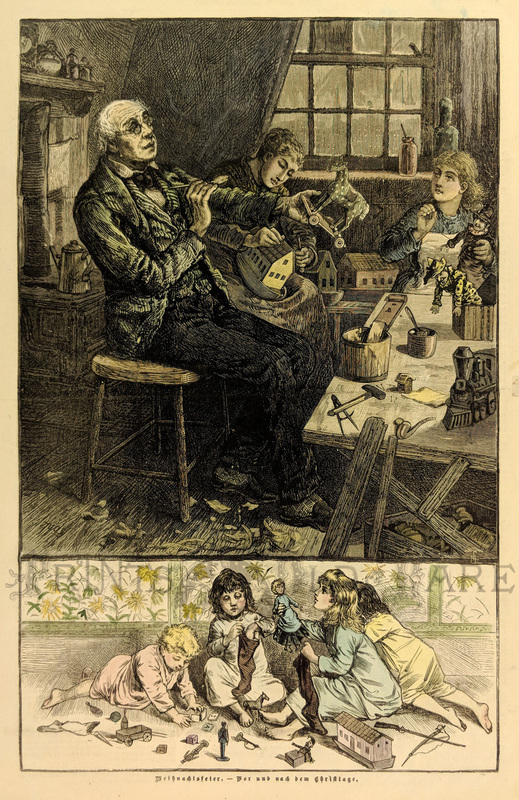 1869 Hand colored wood engraving featured in Harper's Weekly, A Journal of Civilization titled, "Home For the Holidays." 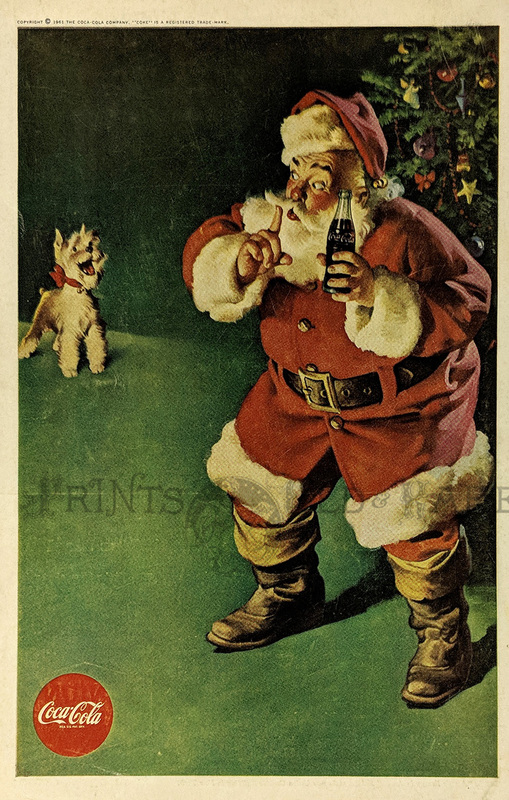 1961 Coca-Cola advertisement featuring Santa Claus whispering to a barking dog as Santa holds a bottle of Coca-Cola in his hand. Copyright 1961 The Coca-Cola Company. 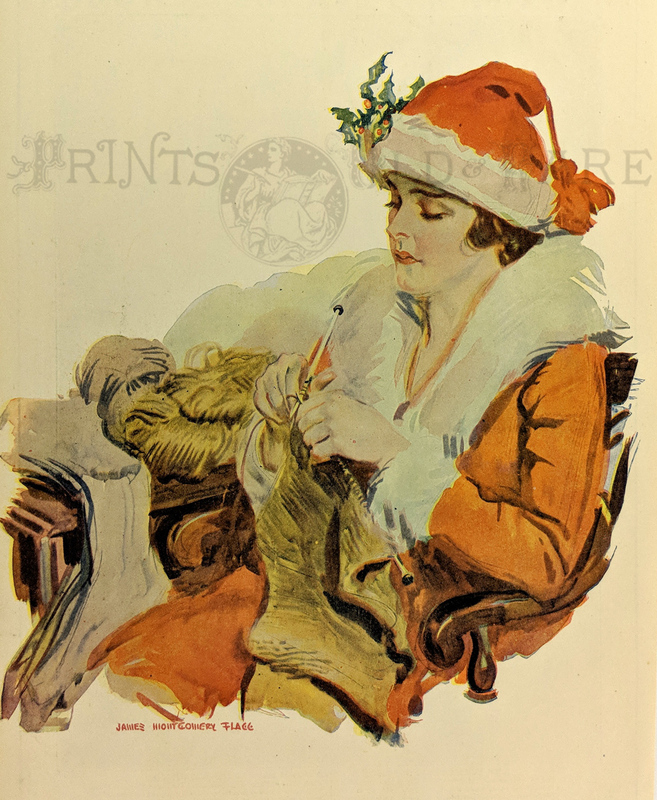 1918 Chromolithograph featured in Frank Leslie's Illustrated Newspaper by the artist, James Montgomery Flagg which shows a woman portrayed as Mrs. Claus who is knitting Christmas stockings. 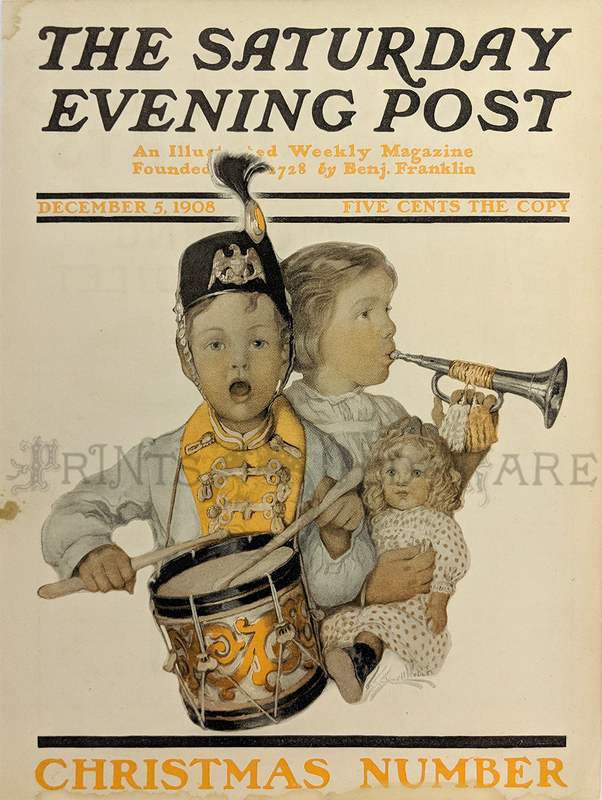 1911 Half-tone featured in Harper's Weekly, A Journal of Civilization titled, "Christmas Memories," drawn and copyrighted by W.E. Mears and Harper & Bros., New York. 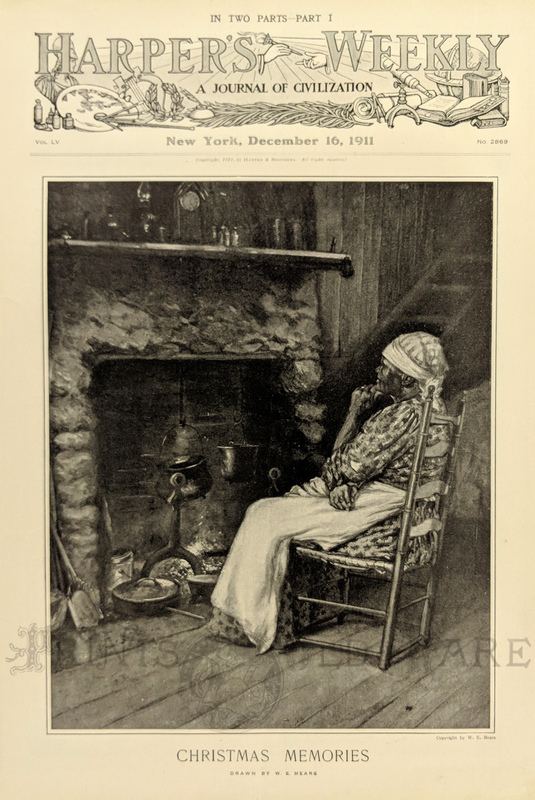 Scene shows an old woman, deep in thought, watching her food cooking in the fireplace. 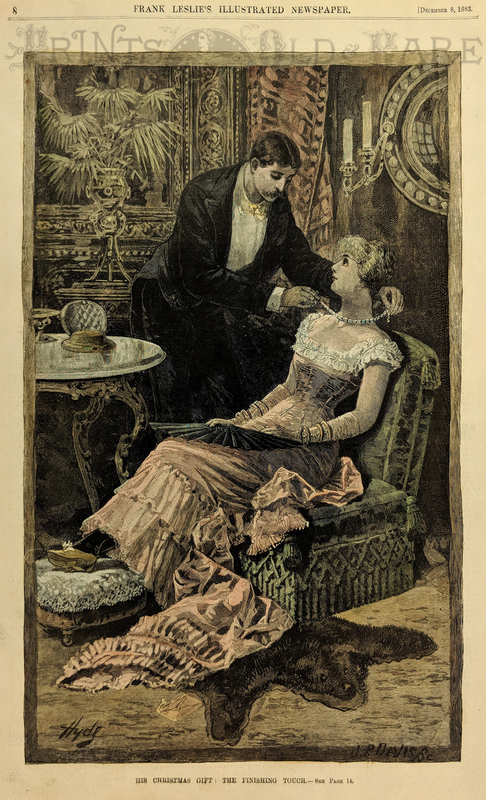 1901 Hand colored half-tone by the artist, W.A. Rogers, featured in Harper's Weekly titled, "Making Up For the Part." 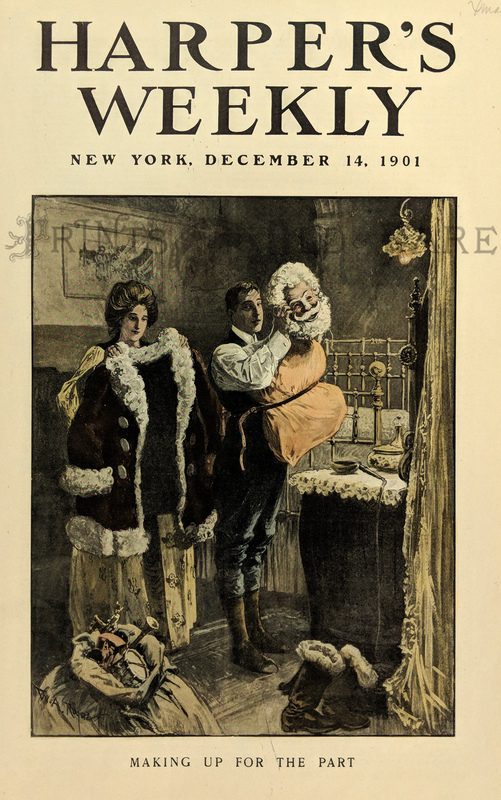 Scene shows a man putting on his Santa Claus attire as a woman helps him with his coat. 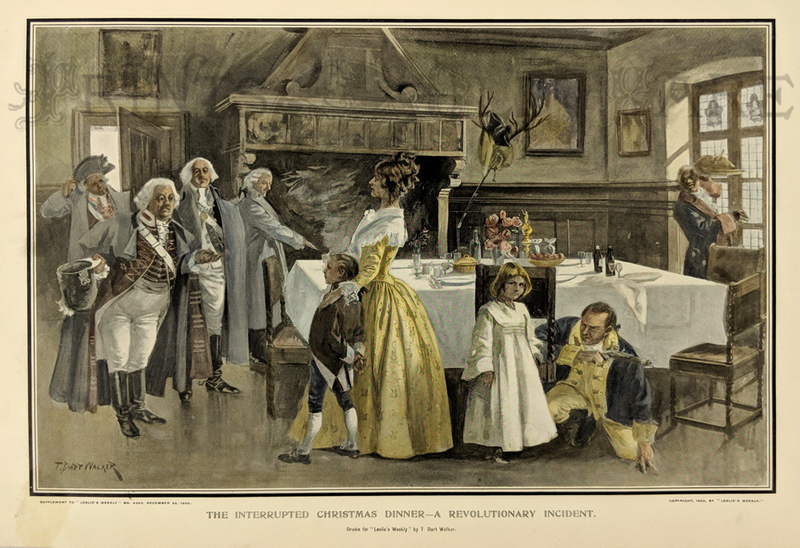 1900 Hand colored half-tone featured in a Supplement to Leslie's Weekly for December 22, 1900 titled, "The Interrupted Christmas Dinner -- A Revolutionary Incident. Artist is T. Dart Walker. 1911 Hand colored half-tone by the artist, F. Strothmann titled, "Christmas Eve On the Flat-House Roof." 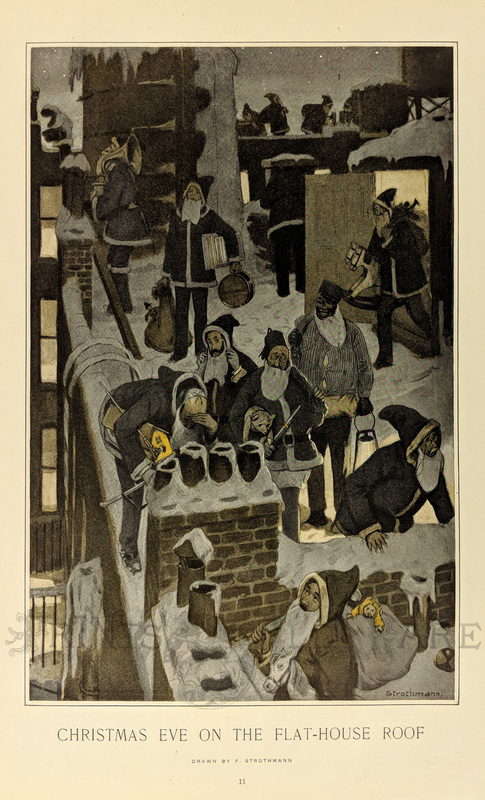 Scene shows men dressed like Santa Claus with attachable white beards holding bags of toys up on a snow-covered rooftop. Santa’s Return Home by W.A. Rogers. Shows him relaxing with reindeer in back round, elves pulling off his boots. 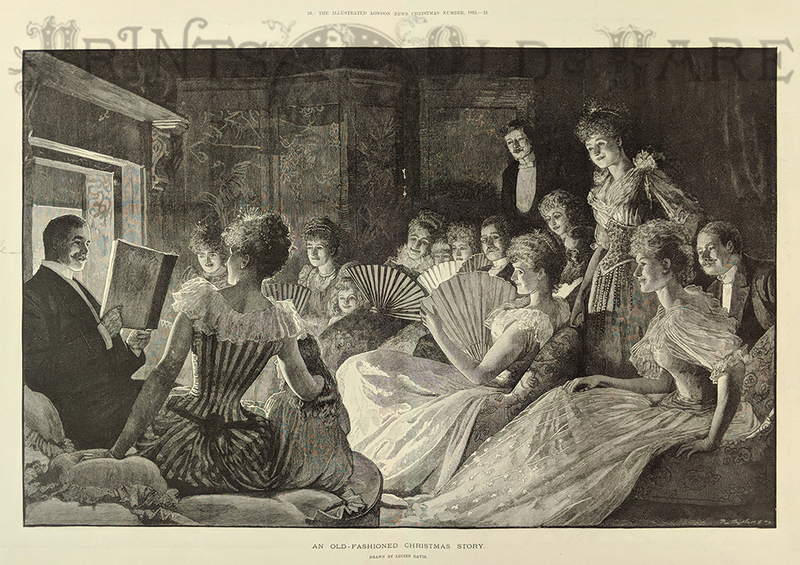 1879 Harper’s Weekly. Water colored, half-tone engraving. Santa Claus Round the World. 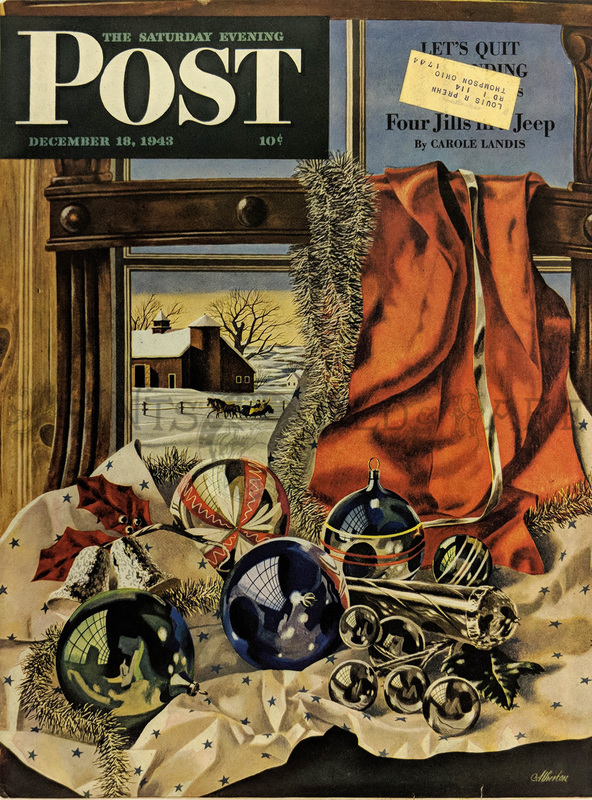 4 vignettes of Santa delivering gifts to Europe, Asia, Africa and America. 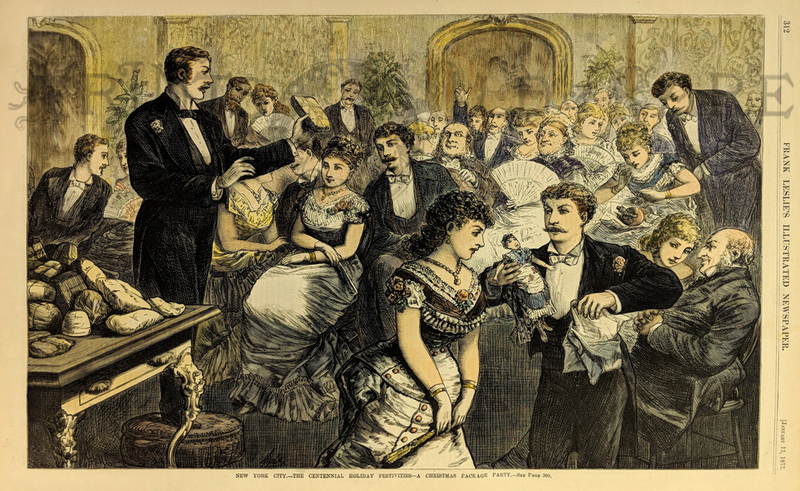 1877 Harper’s Weekly. Hand colored, wood engraving. 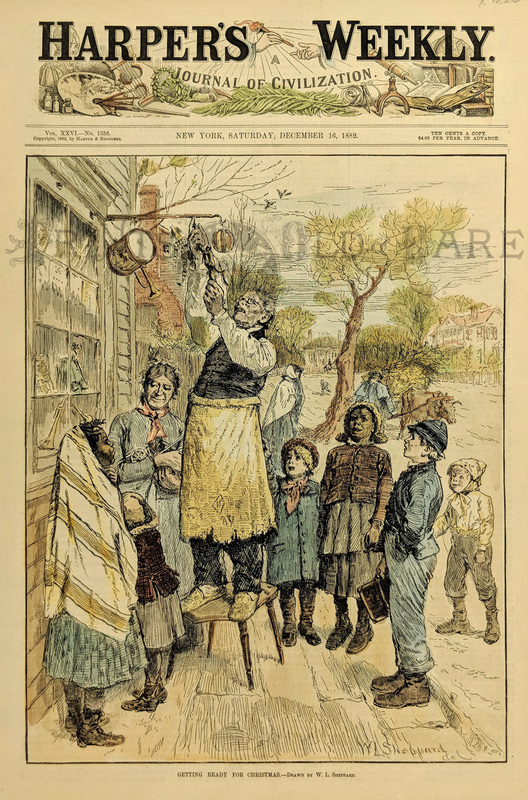 1887 Hand colored wood engraving featured in Frank Leslie's Illustrated Newspaper titled, "The Long Sermon and the Waiting Christmas Dinner -- Watching the Clock." 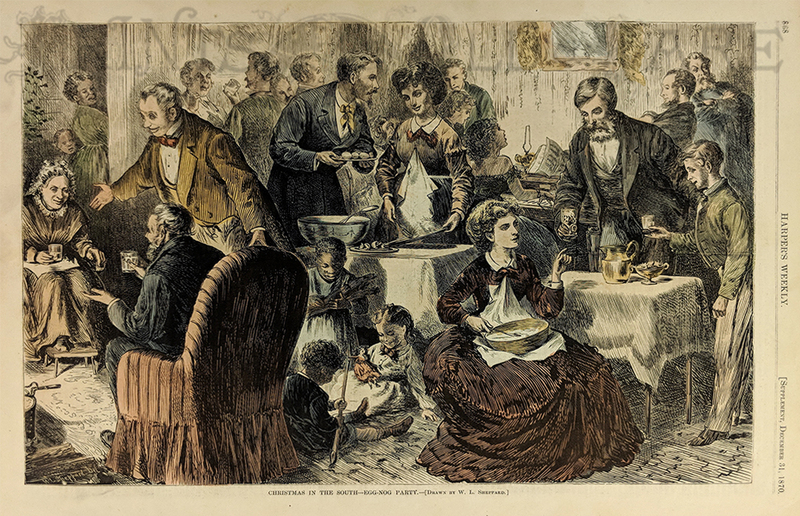 Scene shows parishoners glancing back at the clock while the preacher drones on and on as they anticipate Christmas dinner. 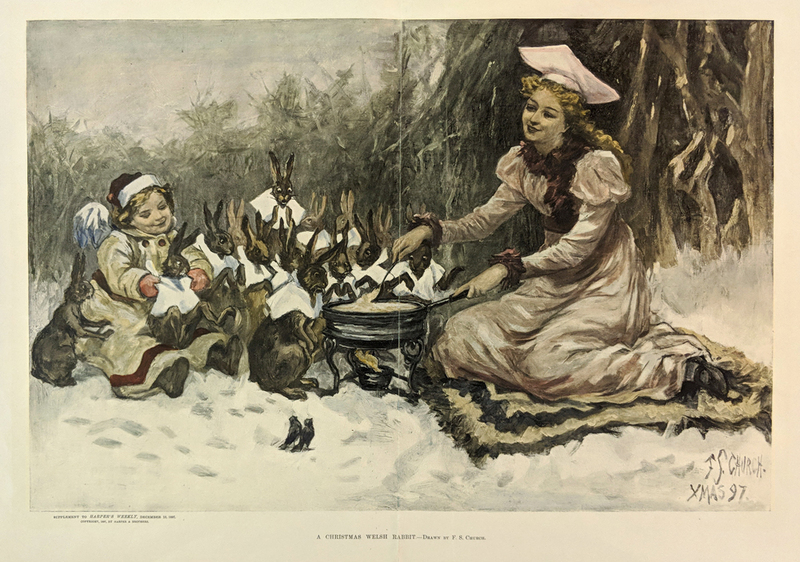 1893 Hand colored half-tone featured in Harper's Weekly titled, "Christmas In the South -- "See, the Conquering Heroines Come," drawn by C.S. Reinhart. 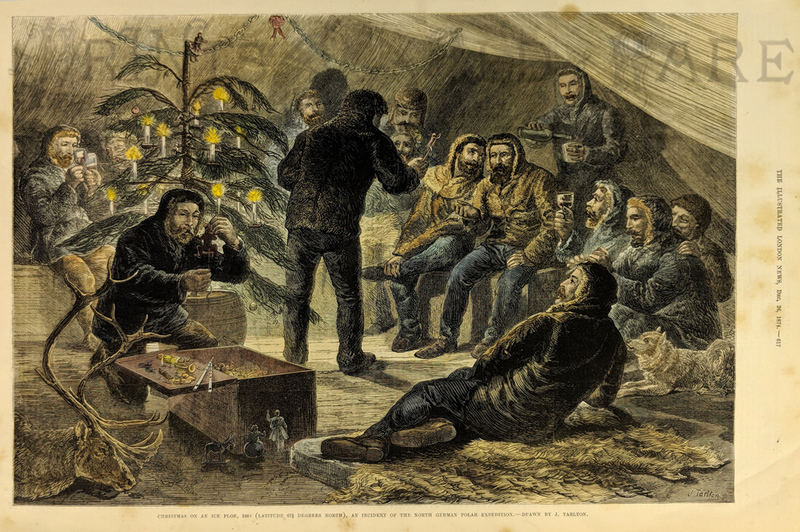 1870 Hand colored wood engraving featured as a Supplement in Harper's Weekly titled, "Christmas in the South -- Egg-Nog Party," which was drawn by W.L. Sheppard. 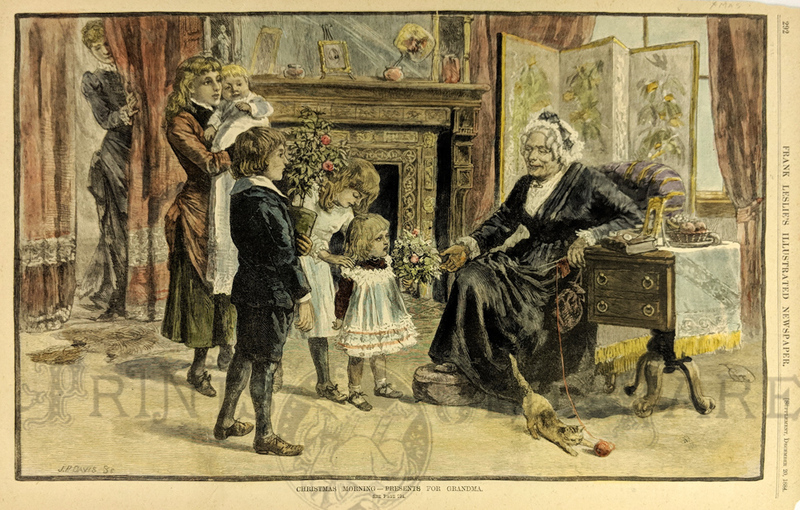 1891 Hand colored wood engraving featured in The Illustrated London News, drawn by Tom Taylor titled, "The Queen of Sheba: An Amusing Christmas Game." 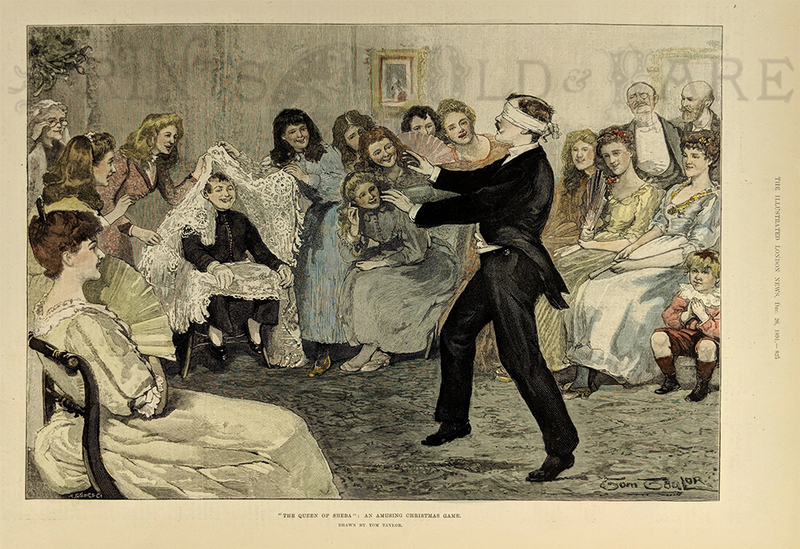 Scene shows a blind-folded man trying to locate "The Queen of Sheba" in a party game as guests look on. 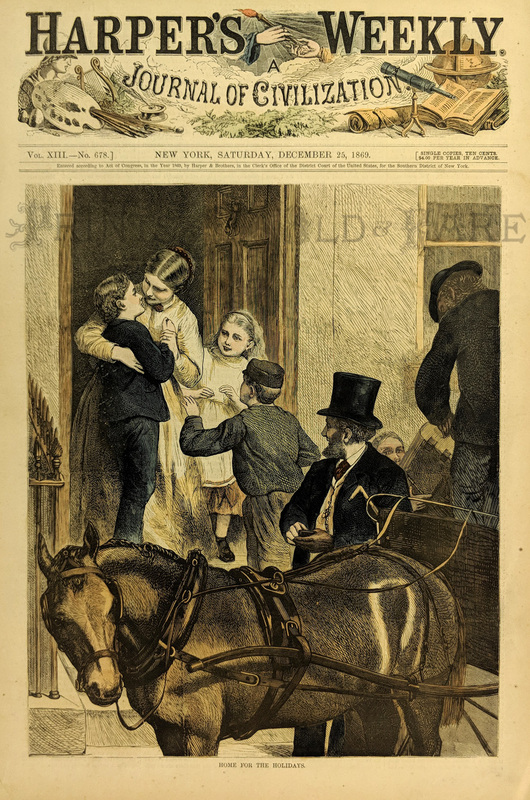 1894 Half-tone featured in Harper's Weekly, A Journal of Civilization titled, "Christmas in Politics, A Few Things the People Wouldn't Have." Scene shows Santa Claus emptying his bag of political misfortune. 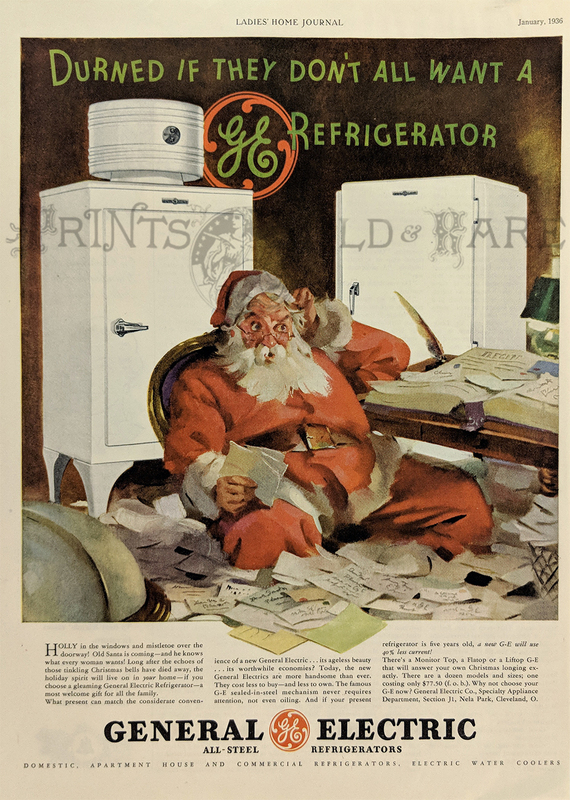 1936 Color advertisement for General Electric All-Steel Refrigerators featured in Ladies' Home Journal showing Santa Claus sitting amid a pile of Santa letter requests as the title of page reads, "Durned If They Don't All Want A Refrigerator." 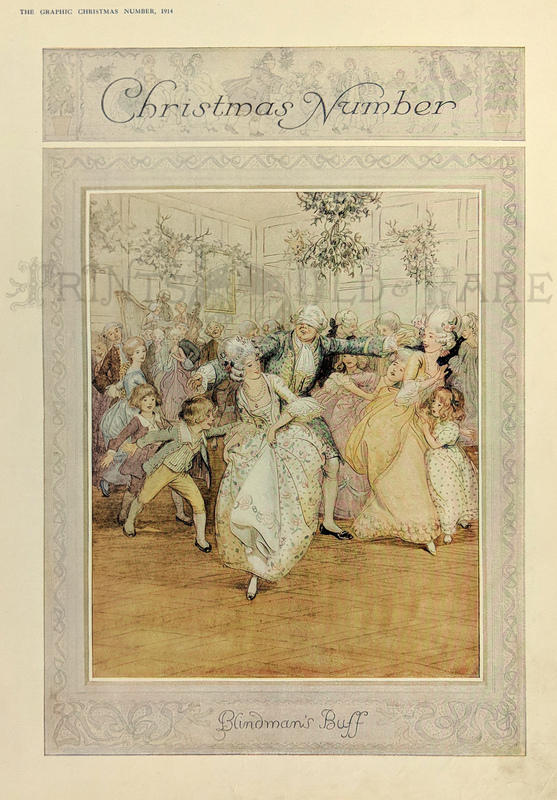 1900 Chromolithograph featured in Harper's Weekly titled, "A Christmas Masque." 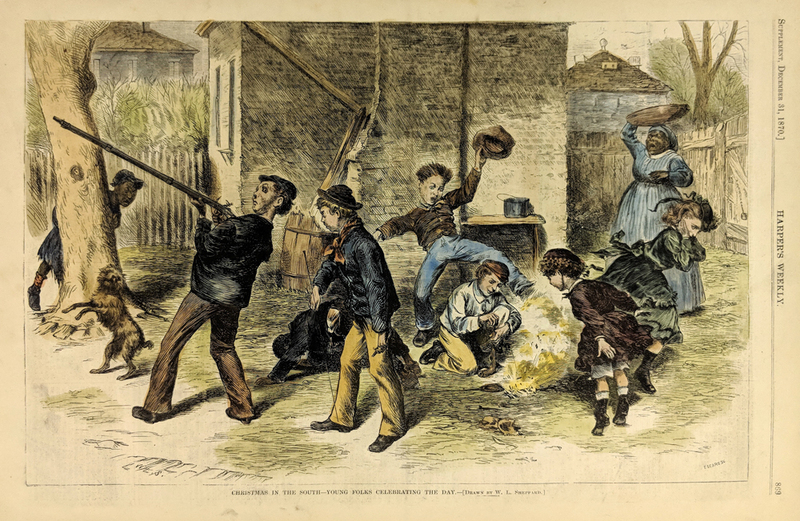 1877 Hand colored wood engraving featured in Frank Leslie's Illustrated Newspaper titled, "New York City -- The Centennial Holiday Festivities -- A Christmas Package Party." 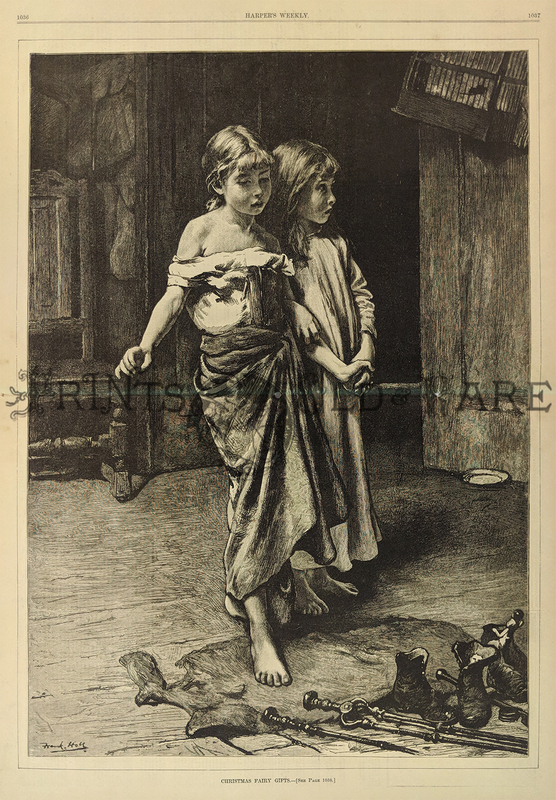 1892 Double-page wood engraving featured in The Illustrated London News Christmas Number, 1892, titled "An Old-Fashioned Christmas Story," drawn by Lucien Davis. 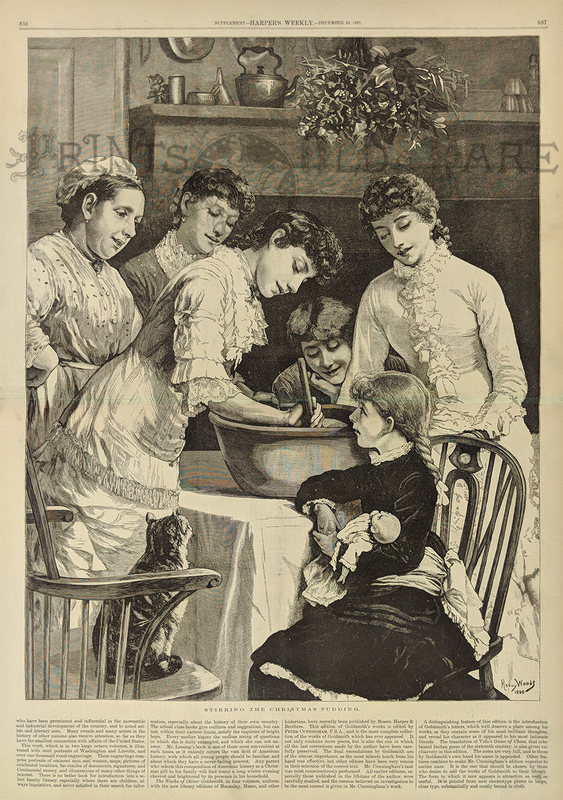 1881 Double-page wood engraving featured as a Supplement to Harper's Weekly by Henny Woods titled, "Stirring the Christmas Pudding." 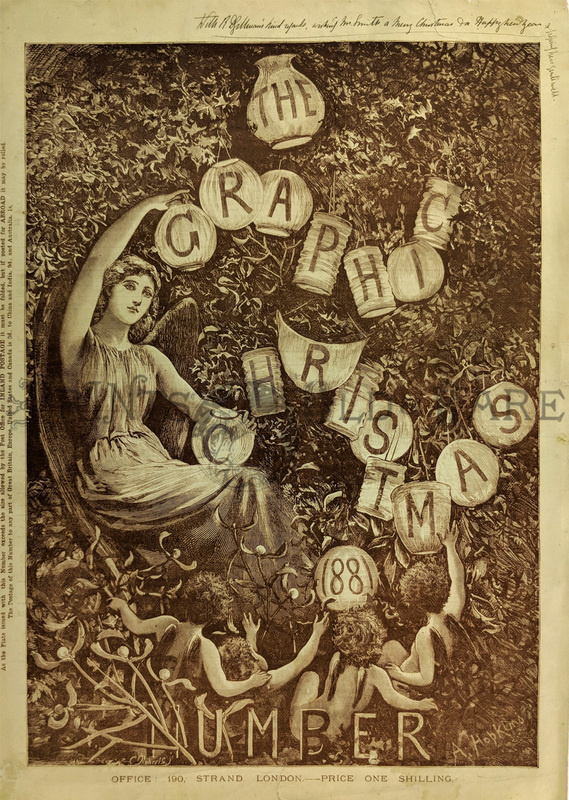 1878 Wood engraving on a double-page featured in Harper's Weekly titled, "Christmas Fairy Gifts." 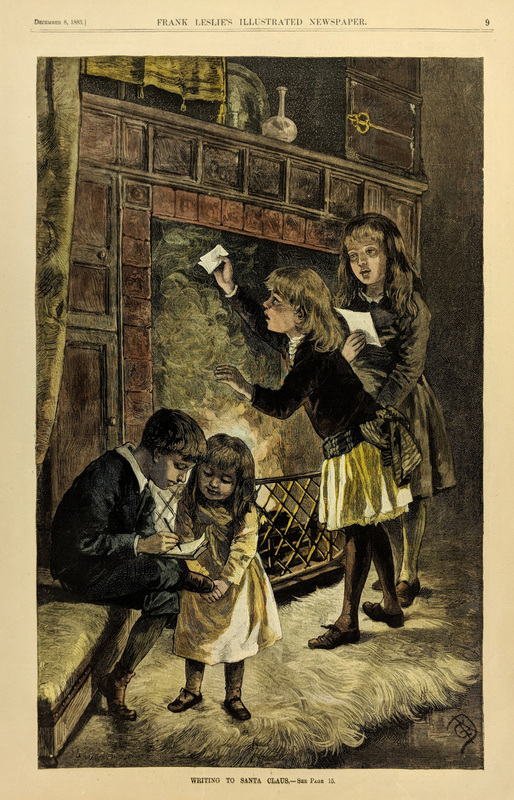 Scene shows two young girls in wonderment surveying boots and fireplace accessories. 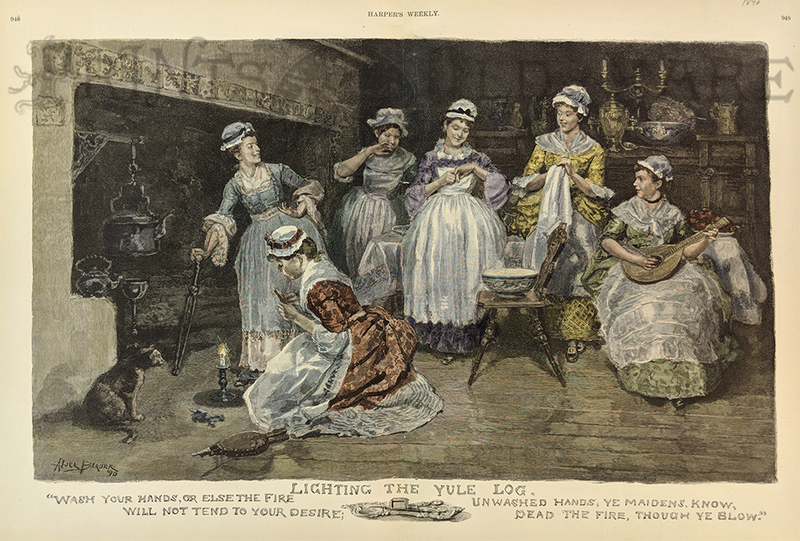 1876 Hand colored wood engraving featured in a Supplement to Harper's Weekly titled, "Stirring the Christmas Pudding." 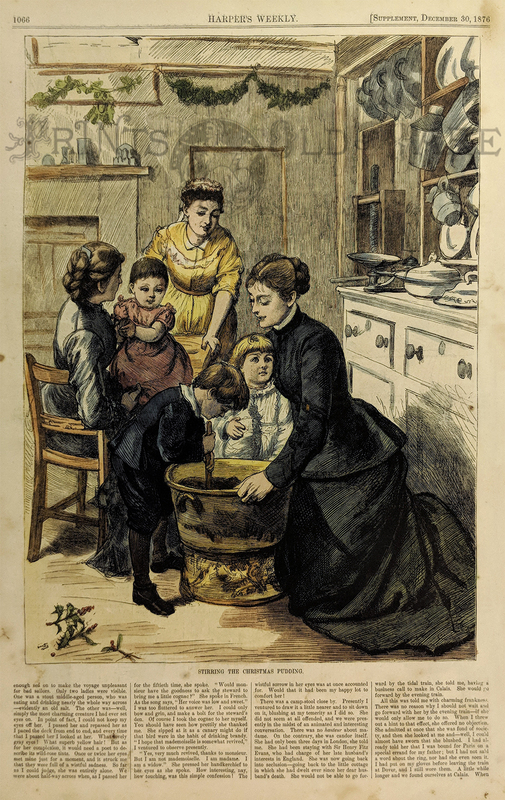 Scene shows a family gathered around a tub of pudding as a young boy stirs it. 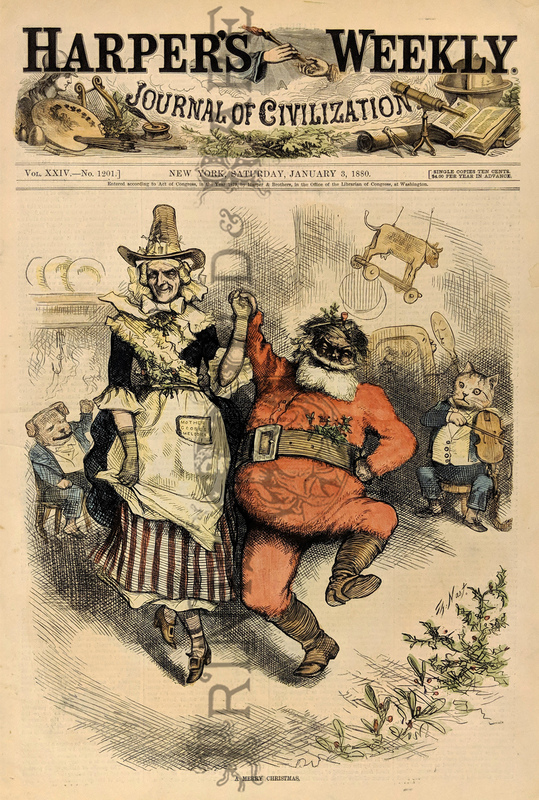 1860 Hand colored wood engraving featured in The Illustrated London News which is titled, "Christmas in Leap Year," by Florence Claxton. 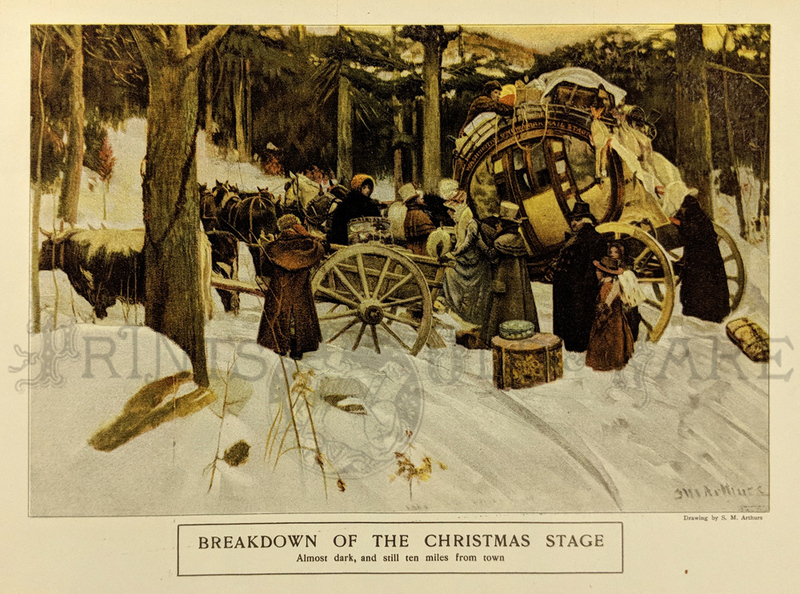 Four scenes surround one scene in the middle displaying "Xmas in 1860" and the "British Museum in 1960" which is portrayed as being an "Extinct Species." 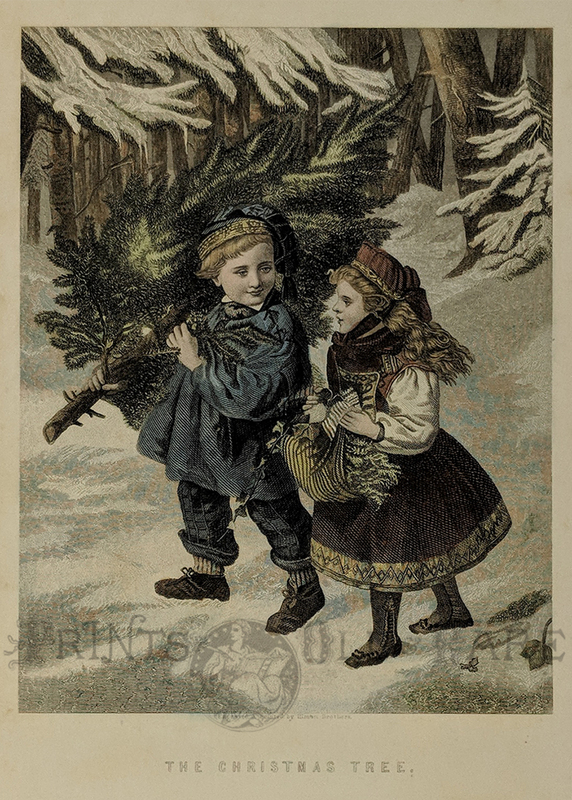 C.1860 Hand colored steel engraving titled, "The Christmas Tree," which shows a boy and a girl carrying a freshly cut tree and a garland of leaves to decorate it with. 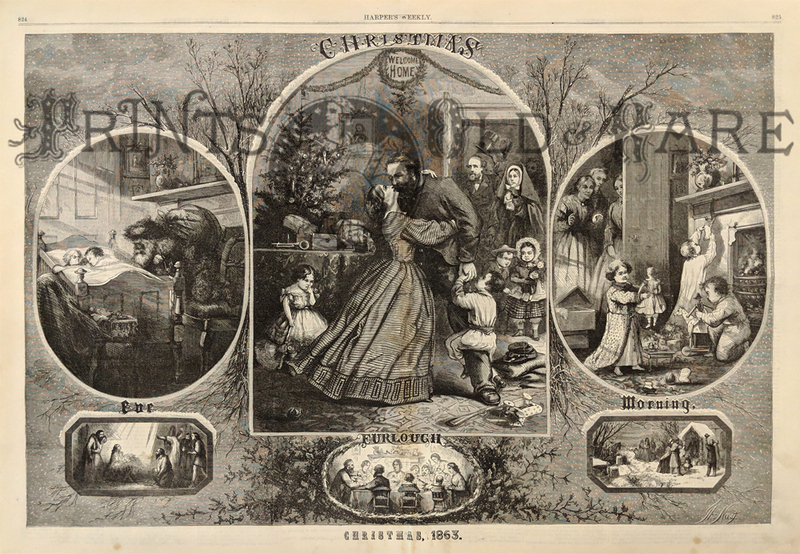 1882 Rare Nast Christmas wood engraving titled, "Come, Now, Santa Claus; I's Ready." Featured in Harper's Bazar. 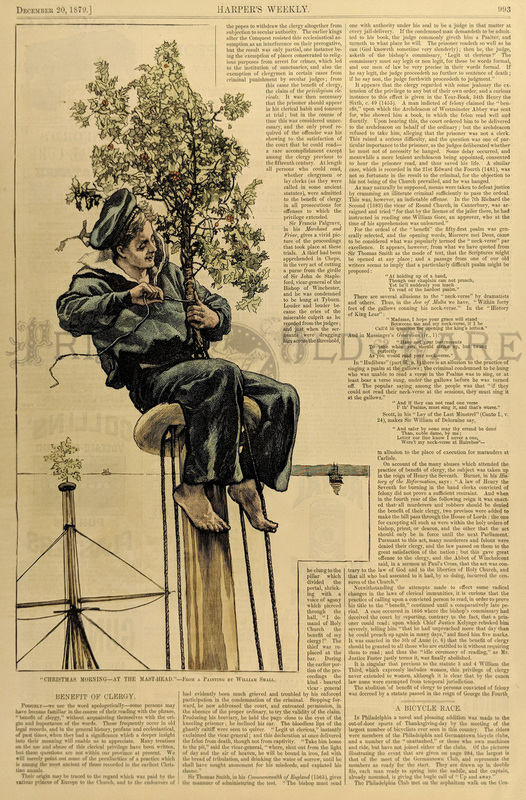 Image shows a little girl standing under some mistletoe. 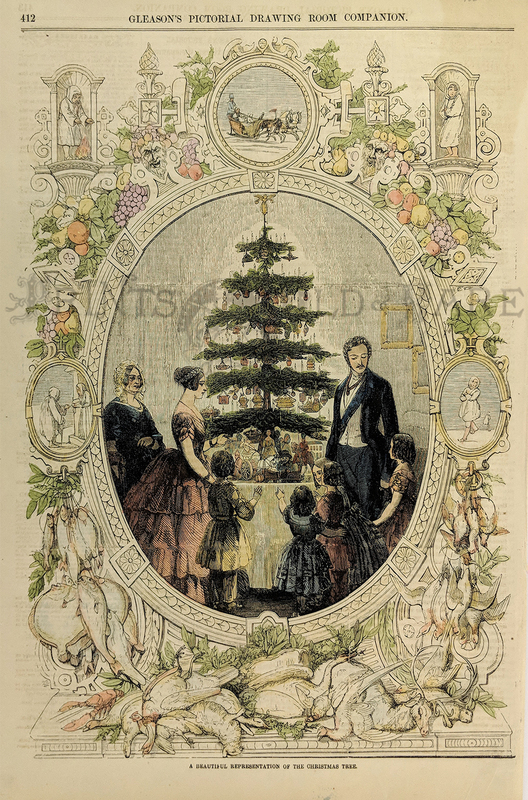 1846 Hand colored wood engraving titled, "Pictures For Christmas, -- The Mistletoe." 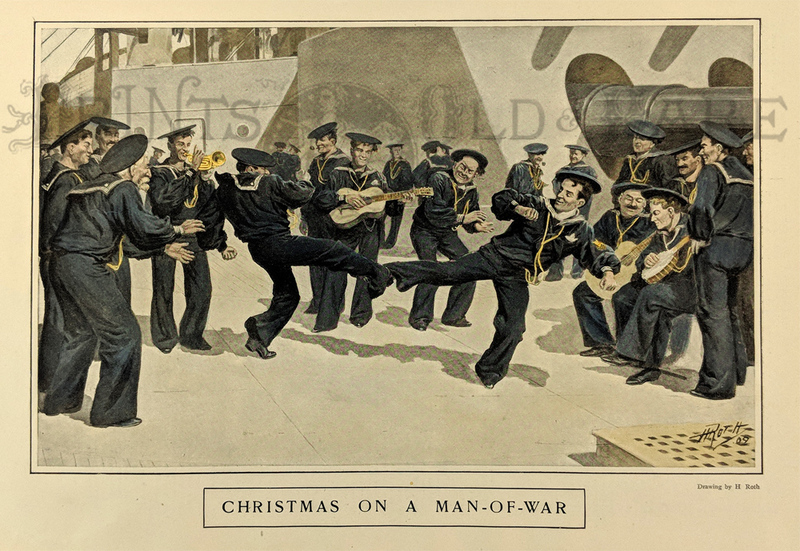 Drawn by Kenny Meadows and featured in The Illustrated London News.